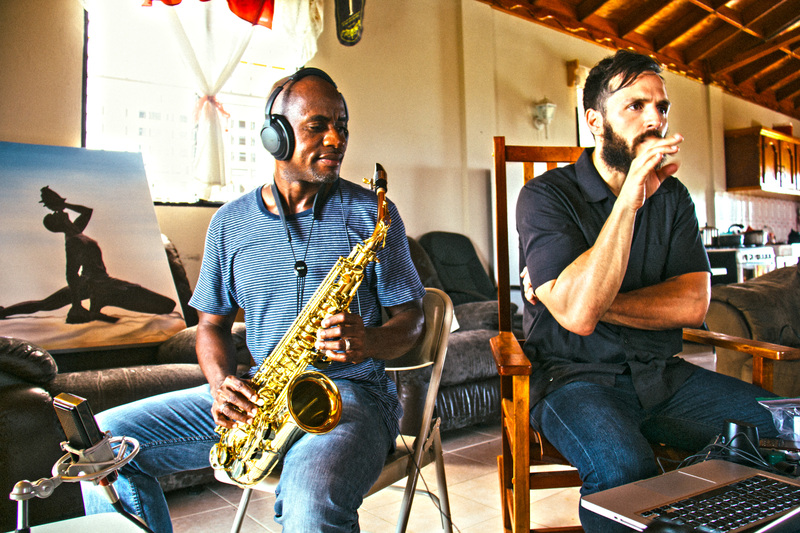 Joel and Sony hold a special place in many of our hearts. We first met Sony several years ago, hanging out in the yard of a local orphanage we frequent. 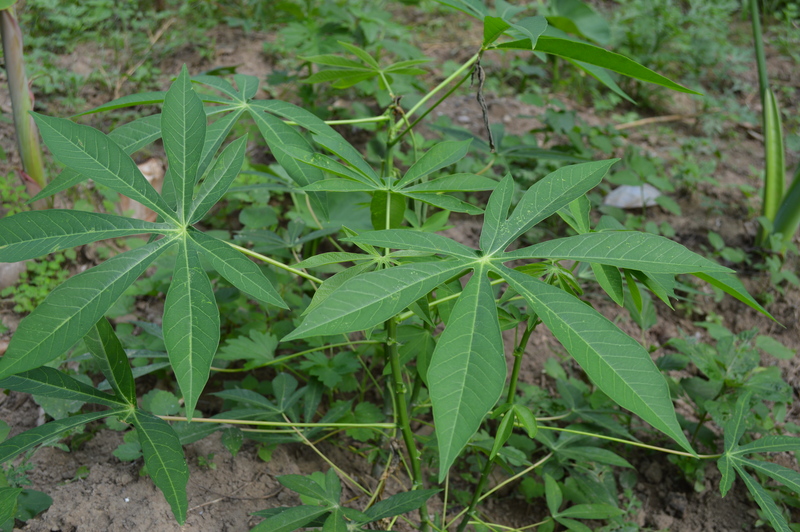 As a “street kid,” he was not part of the orphanage and couldn’t attend the school there. We’d see him on every trip, just hanging out in that same yard. It took us a few years to really get to know him and hear his family’s difficult story. 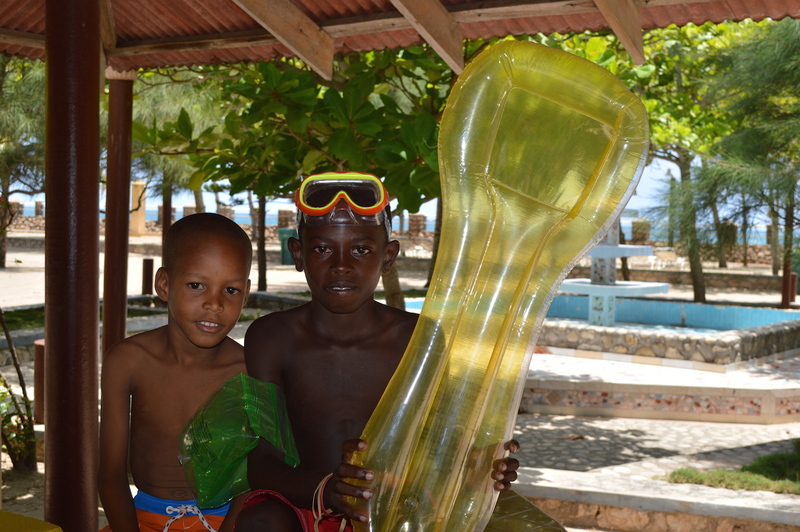 Espwa has been supporting his education for the past two years. At the same time, and unbeknownst to our team, one of the families in our network, the Hoobler’s, formed a relationship with Sony’s brother, Joel. They grew to sincerely admire his work ethic at school and in the support of his family. 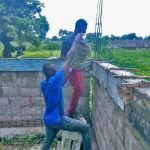 This trustworthy young man had been slowly working to build his family a home with whatever income he could scrape together. 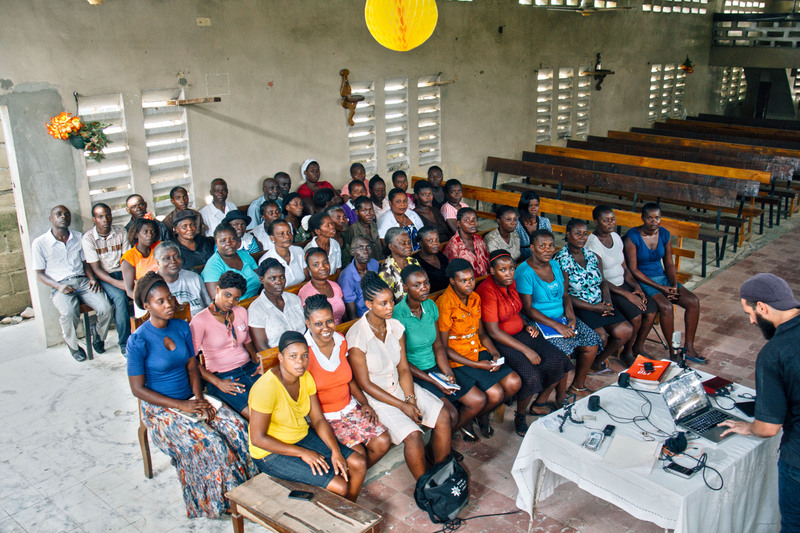 If you know our story at Espwa, you understand that we desire to partner with our Haitian friends in positive ways. We strive to be a “hand up, not a hand out,” building relationships based on trust and commitment. We seek to walk through life with our friends, partnering with them, getting their input, and building them up as productive friends. So when the Hoobler’s approached us with an idea to partner with Joel and Sony in a bigger way, we were excited. 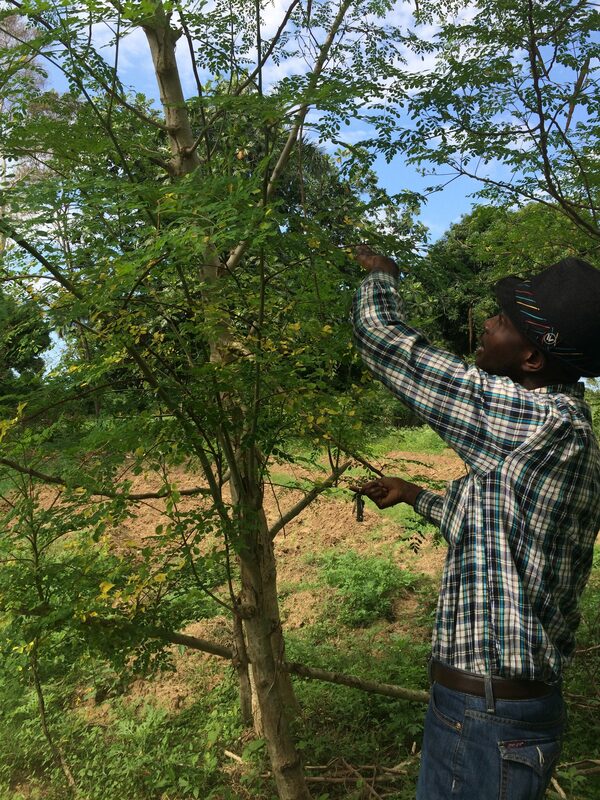 We crafted an agreement with Joel where he will become an apprentice for our farming project lead, Jovenel. 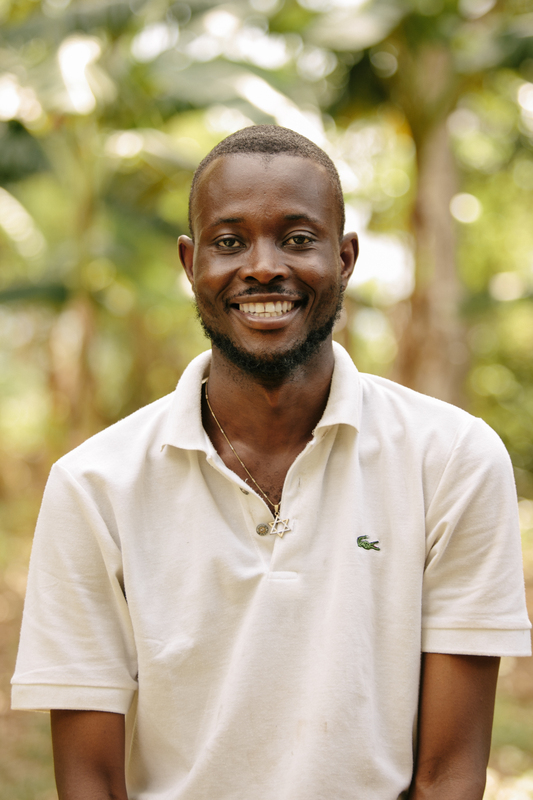 Joel will work with the farming initiative over the next year, assisting Jovenel and at the same time, gaining much mentoring and support in a skill he’s interested in learning. 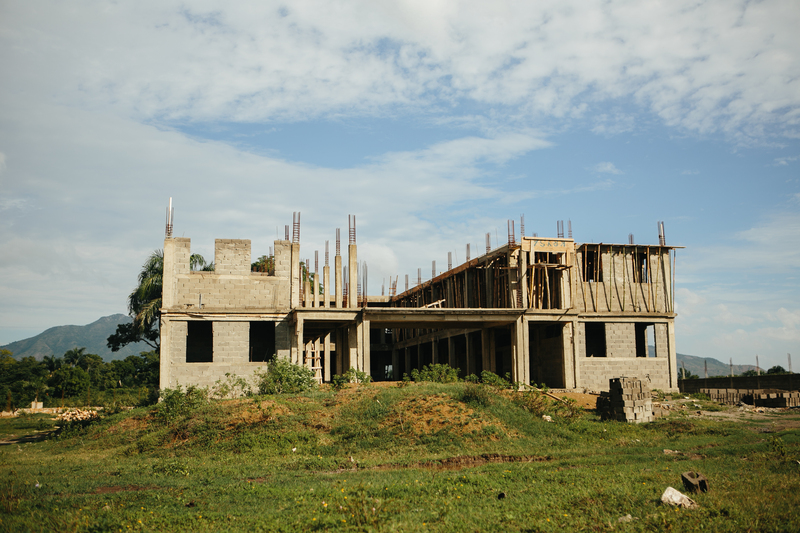 In exchange, we’ll assist Joel with funds that can be put toward the completion of his family’s home. This opportunity will bring accountability, teach new skills, and hopefully set him up for a bright future. We also plan to work with Sony to see what skills and desires he has and try to match him with a project or small business opportunity that is the best fit for his long term success. We can only do this with your generous support. 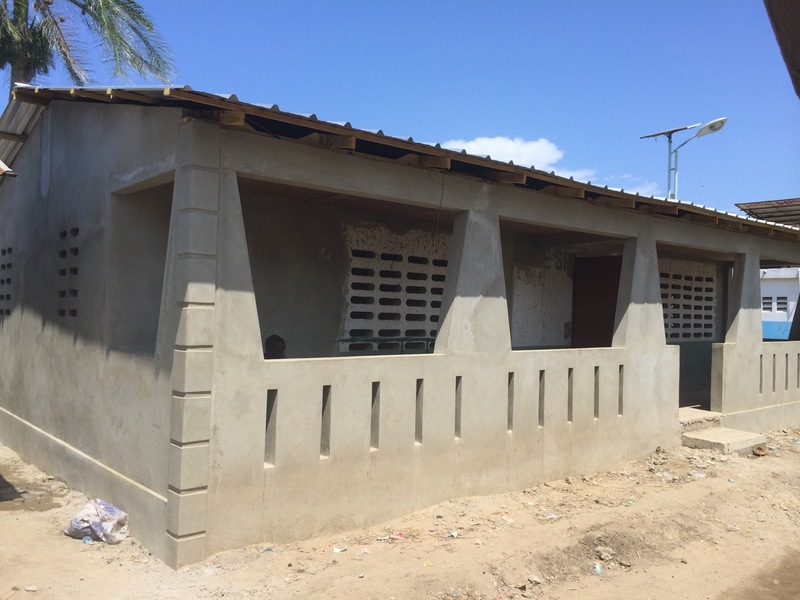 Please visit the fundraising page below to hear more about the project! If you’ve followed our story with the Peace & Joy families over the past several years, you’ve hopefully seen the children flourish after placing them back into stable families (as opposed to the rundown orphanage we found them in). Since then, our long-range vision has been to collaborate with the adult family members and help empower them with stable employment. 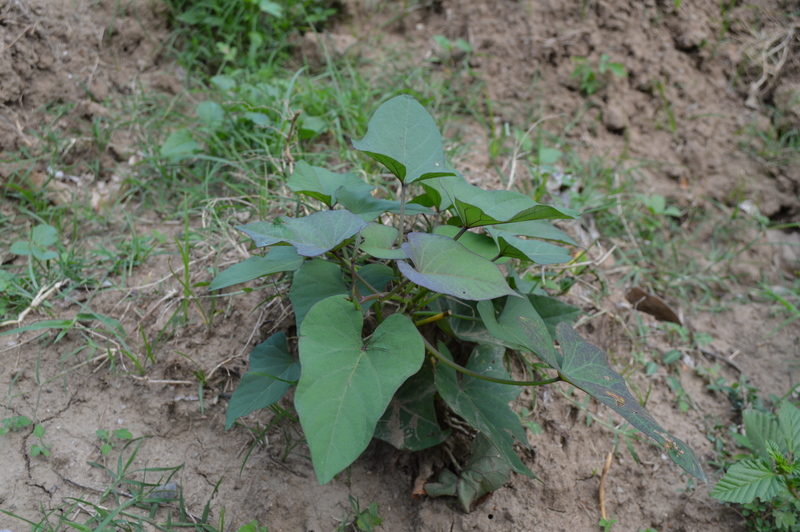 When we first tried to implement this plan in 2015, we became aware of a savings collective that each family was participating in, called a “sol.” We didn’t want to disrupt the self-developed initiative, so we’ve been in a holding pattern, collecting information about each adult’s gifts, abilities, and resources (called asset-based community development). 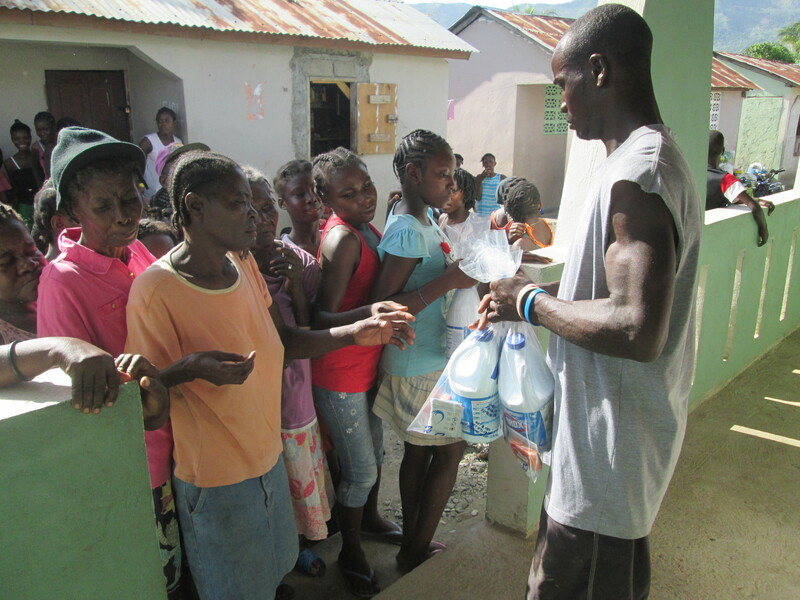 Just recently, we’ve felt convicted about helping the families in areas of basic need. 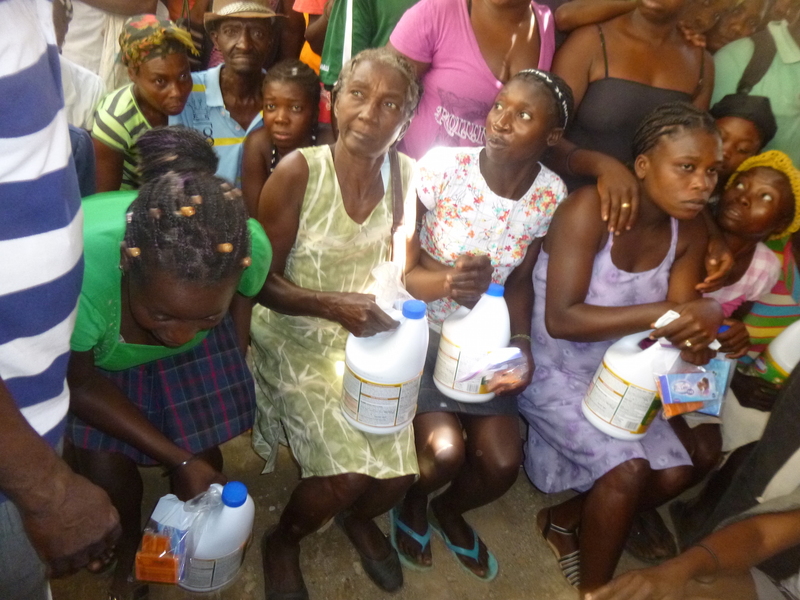 In the aftermath of Hurricane Matthew and the resultant flooding and water-borne diseases, it has become more apparent that the families do not have simple infrastructure like improved plumbing and clean drinking water. There is always a risk of serious health problems under these conditions. If you’re familiar with Maslow’s hierarchy of needs, we have been trying to jump right to ‘esteem’ and ‘self-actualization’ assistance, such as empowering through small business, yet we’ve neglected some basic ‘survival’ and ‘safety’ needs that could dramatically improve quality of life almost instantly. 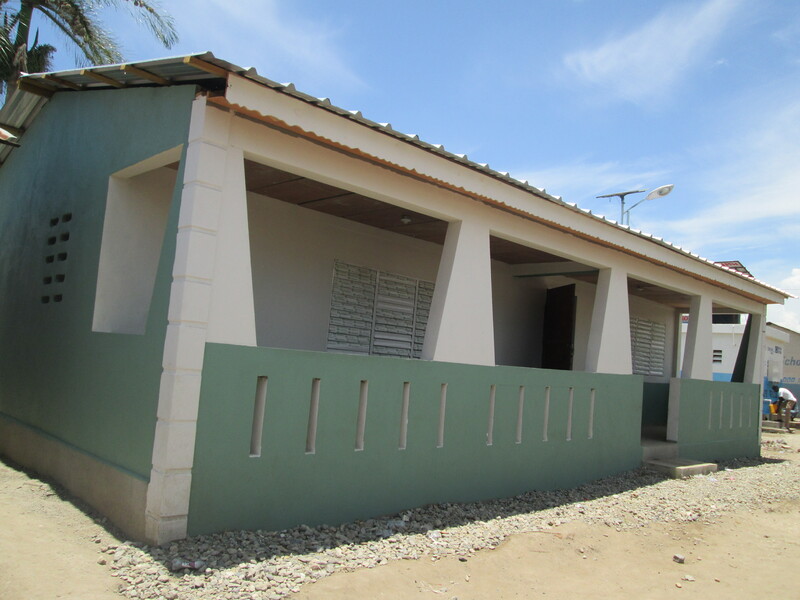 Through our network, we became aware of an opportunity to secure home toilet service for 15 families. 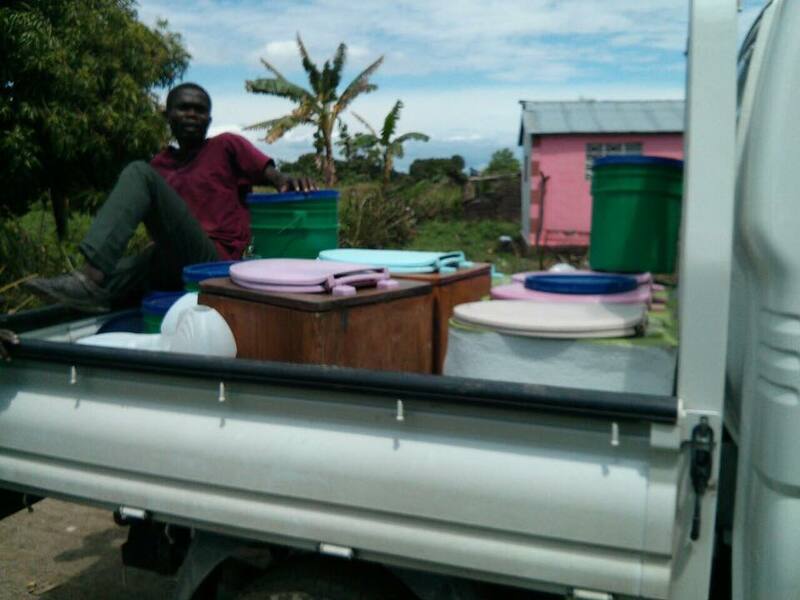 For about the cost of a cup of coffee, a family receives a portable toilet unit that can be placed in the home, as well as regular waste removal service for an entire month. 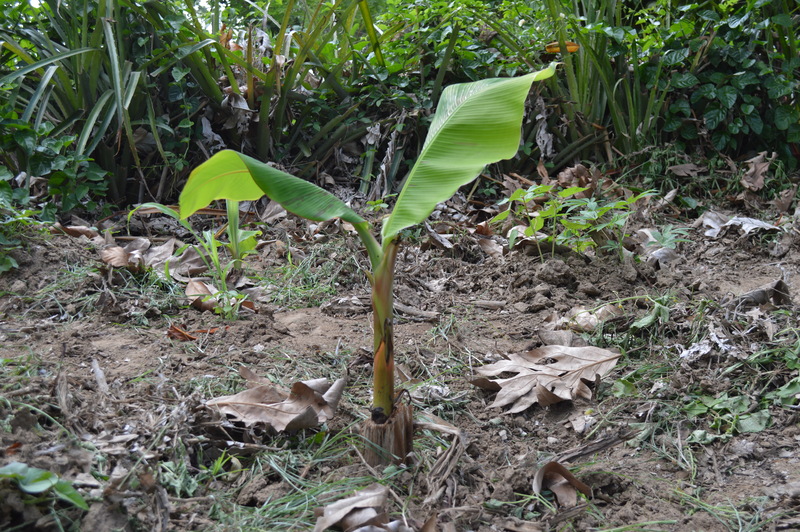 The organization, called Sustainable Organic Integrated Livelihoods (SOIL), employs Haitians at waste treatment centers and uses the recycled compost to help restore Haiti’s heavily deforested landscape. 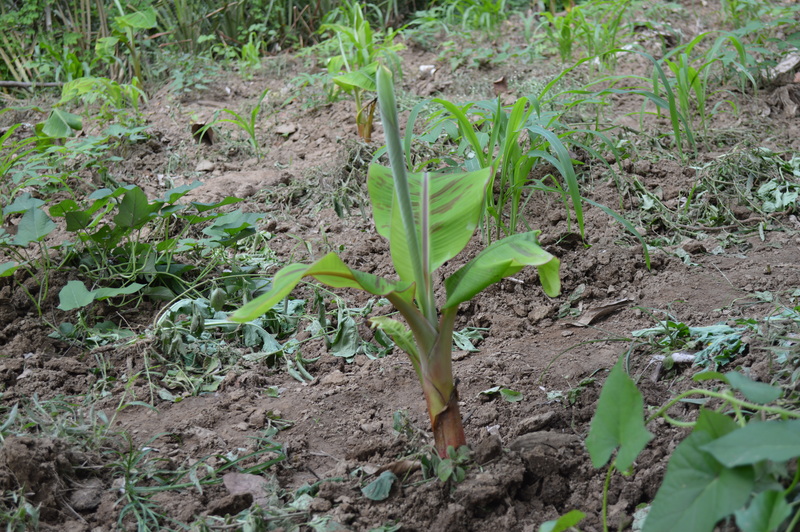 This is a game-changer for the families and we fully support the sustainable business model that SOIL uses. 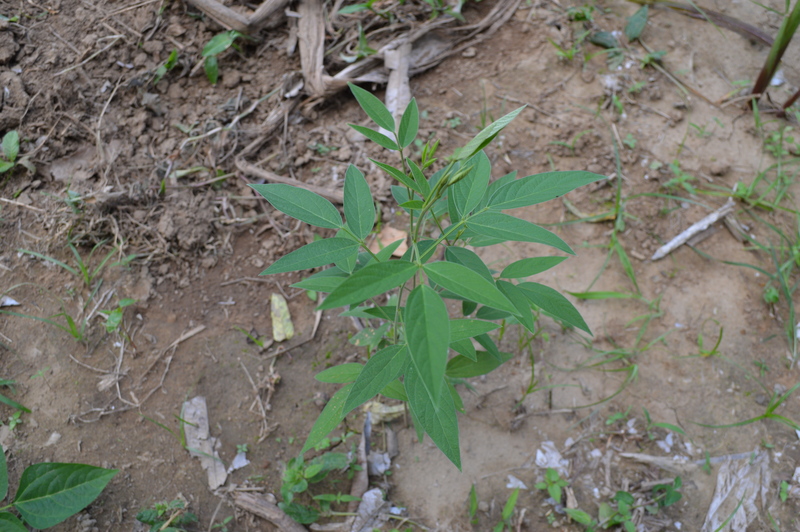 We’re also pursuing a partnership with a clean water well organization. 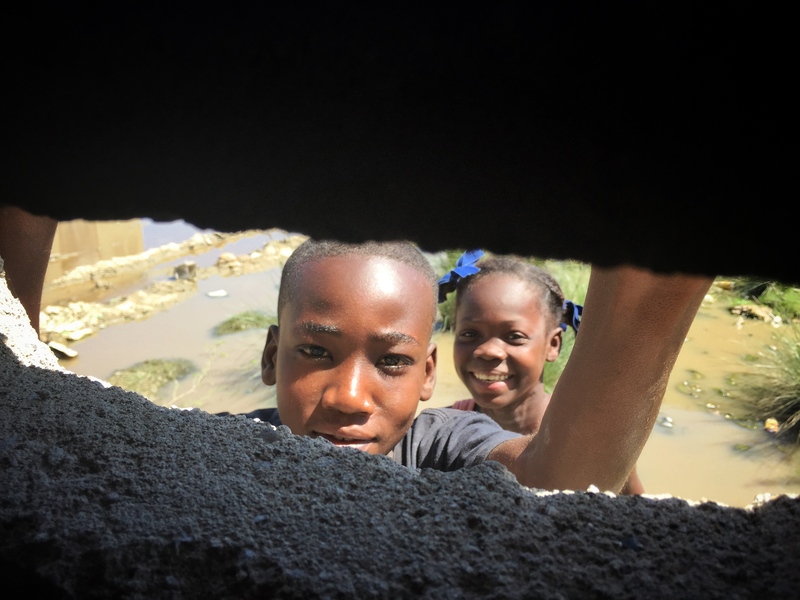 In Haiti, there are a number of NGOs and other entities that have the capability of installing the wells, but we want to make sure we find the right one. 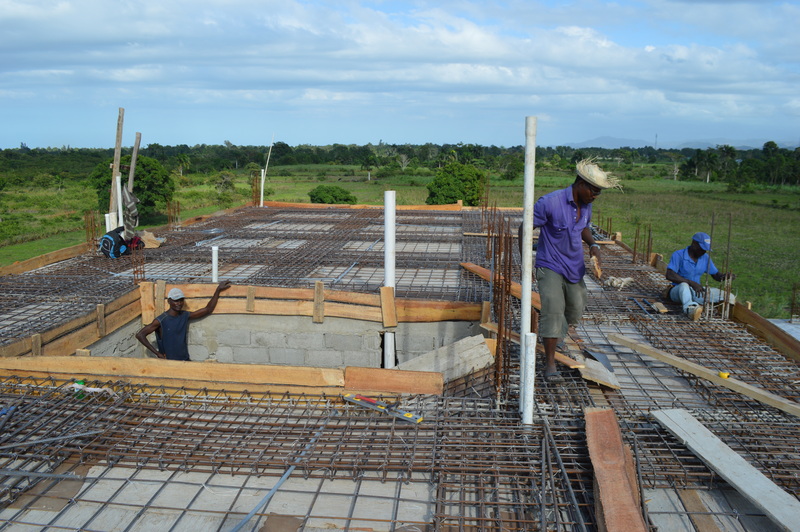 It is important to us that the proper research is done prior to installation, and that the sustainability and maintenance of the well is taken into account. More to come on this as it unfolds. We haven’t made these decisions in a vacuum. We’ve kept the families involved to ensure these are desired changes, and we’ve given them a stake in the implementation process. We know that forming these types of dignifying, mutually respectful relationships is the only way to build trust and develop the community for the long-term. 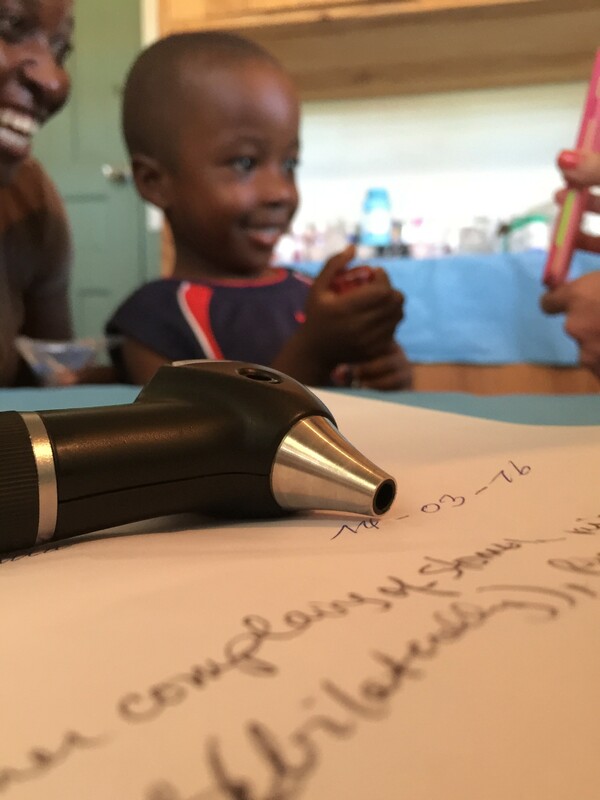 Thank you to all who’ve shown an interest in supporting these projects – we’re excited to see this next frontier in the families’ journey out of poverty. 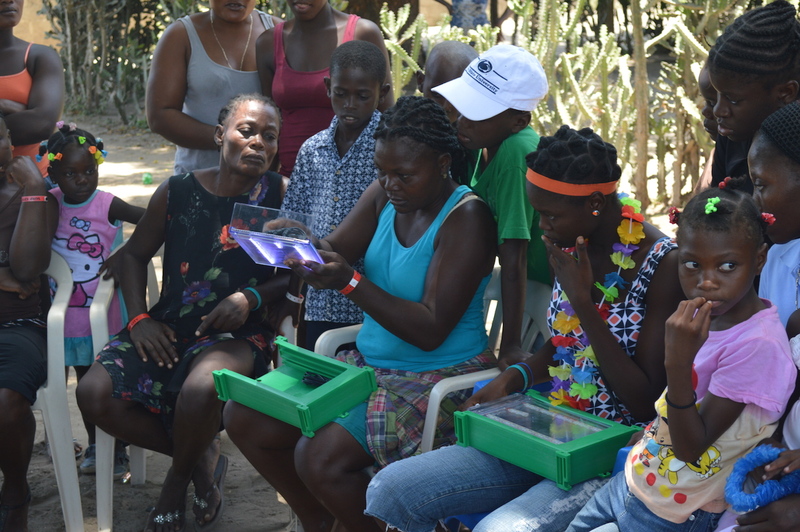 *Featured image courtesy of the SOIL website, www.oursoil.org, showing a family getting trained on how to use the new unit. We are pleased to report that over the past 2 weeks, the first 2 babies have been born at the New Hope Hospital! 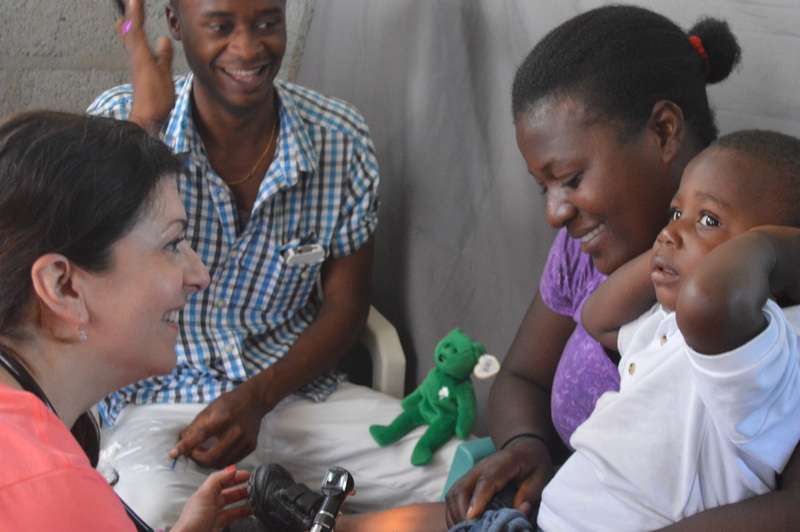 Here’s to many more babies and many more dreams coming true in Haiti. 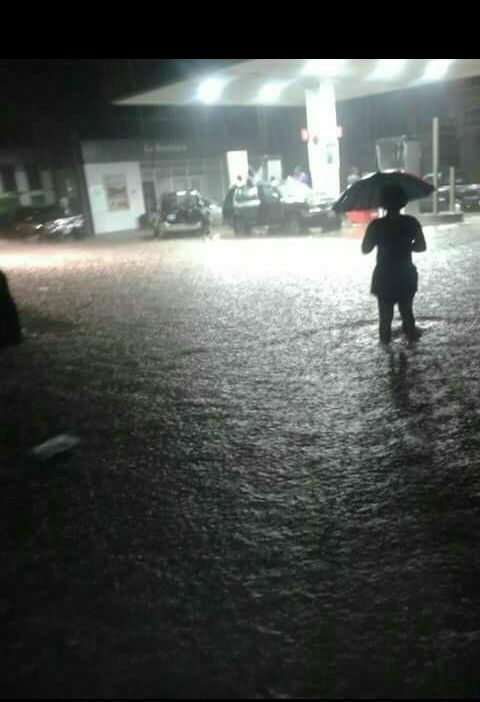 It seems like we were just writing about the heavy rains that resulted from Hurricane Matthew and the waterborne diseases those rains can lead to. 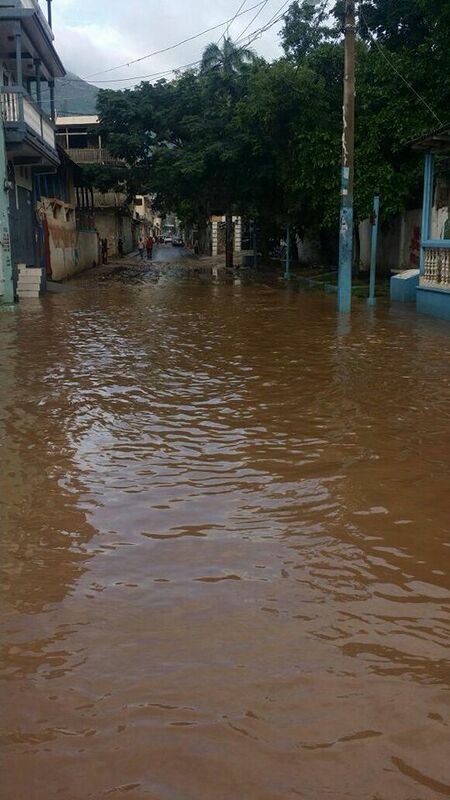 Unfortunately, we received word that even more flooding has hit Cap Haitien after many days of sustained heavy rain. 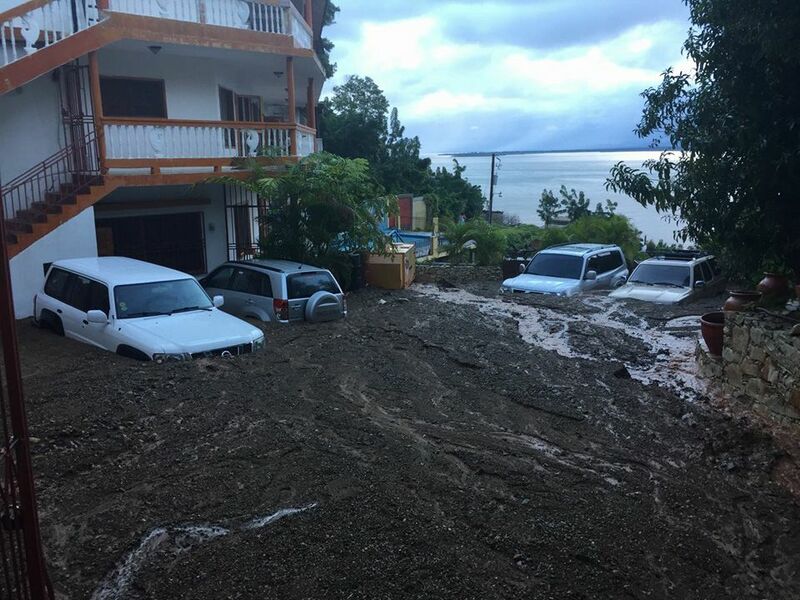 10 people have died in the flooding (to our knowledge), 600+ homes were destroyed, and many vehicles and possessions have simply been swept away. 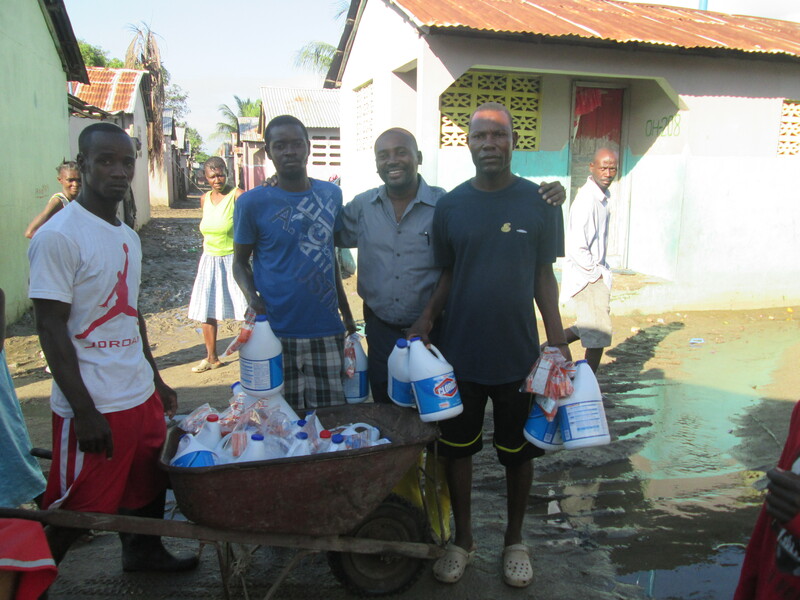 Espwa made an emergency fund distribution to Dr. Eugene, who purchased sanitation supplies to hand out to local families affected by the flooding. 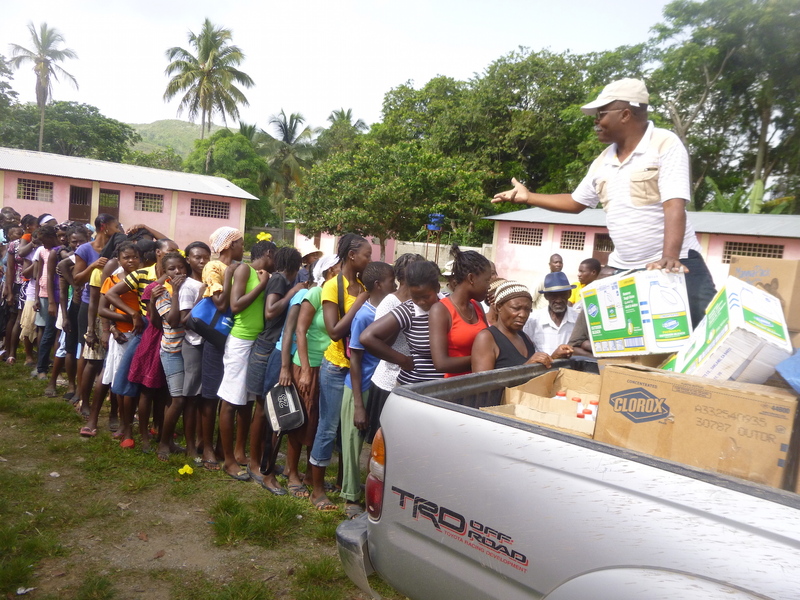 Here are a few photos of the distribution taking place this past week. 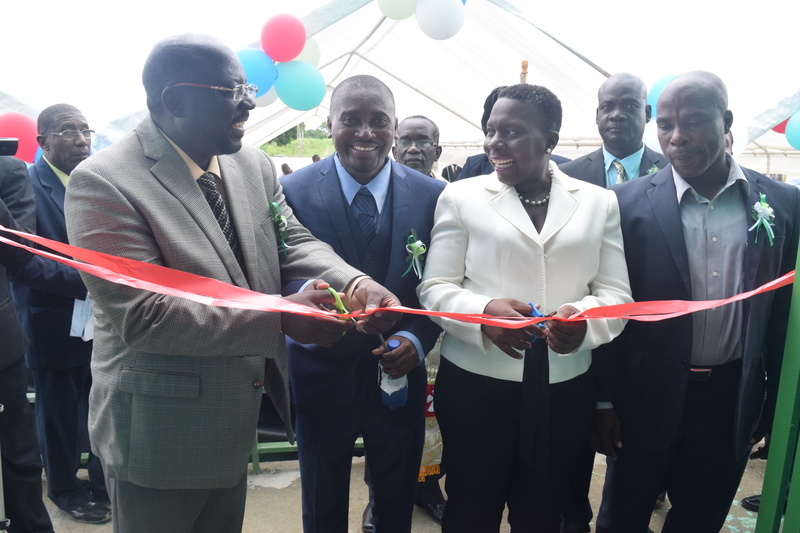 We received word and some very encouraging photos from Dr. Eugene that the New Hope Hospital had its opening ceremony on Thursday! If you remember from only 18 months ago, we were standing on a newly poured foundation, with rebar everywhere, but not much else. Talk about a Herculean effort in such a short amount of time! 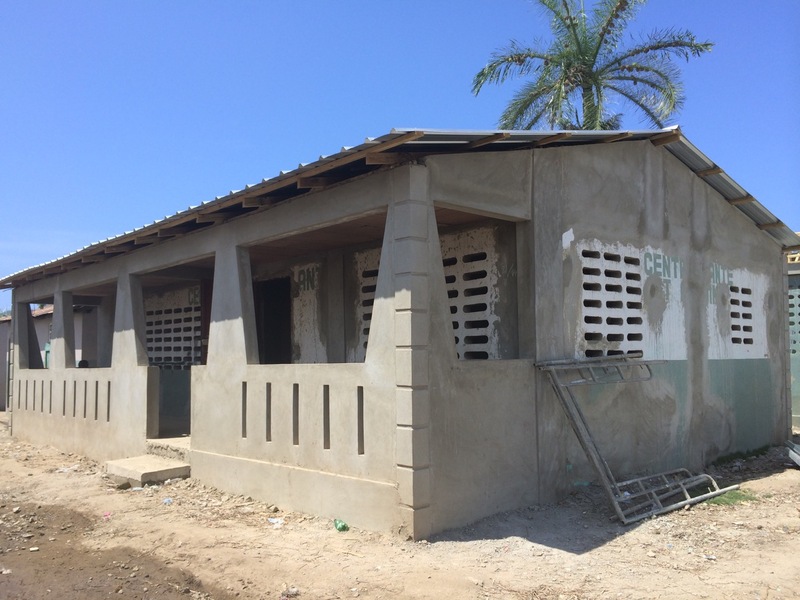 The beauty of this project is that only Haitian labor was used to construct all three floors, all the way down to the finishing touches of tile work and painting. 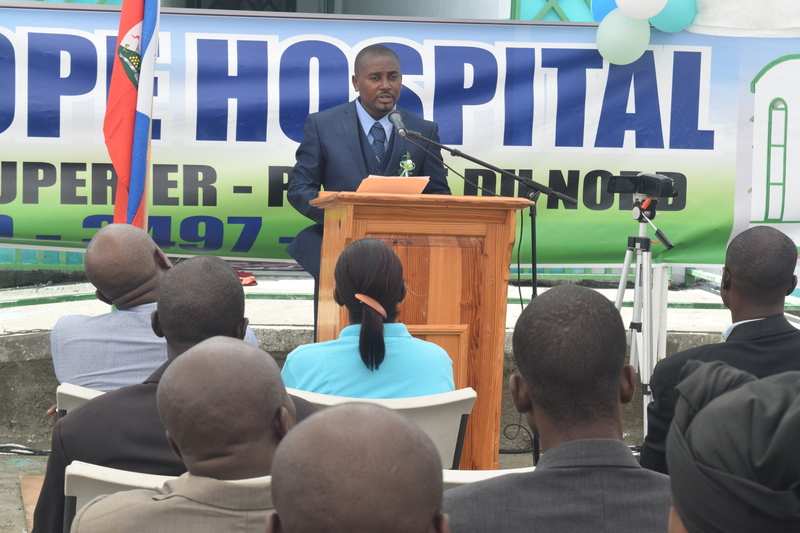 Some American teams did donate their engineering talents (such as the non-profit, Dlo Geri, which added a working water system throughout the hospital), but day in and day out, Haitians made this hospital come alive. 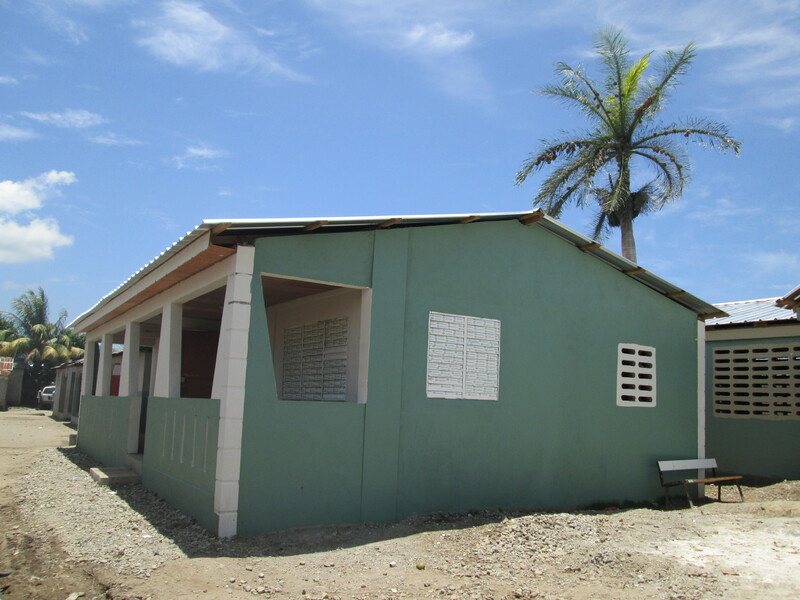 It has been very exciting to see Dr. Eugene’s dream become a reality. 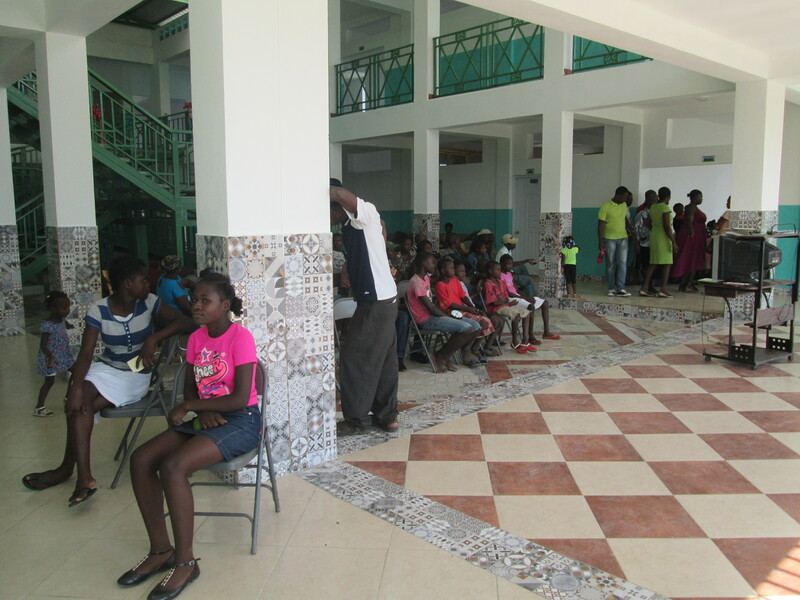 In its opening weekend, the hospital saw 51 patients on Friday and 80 on Saturday. 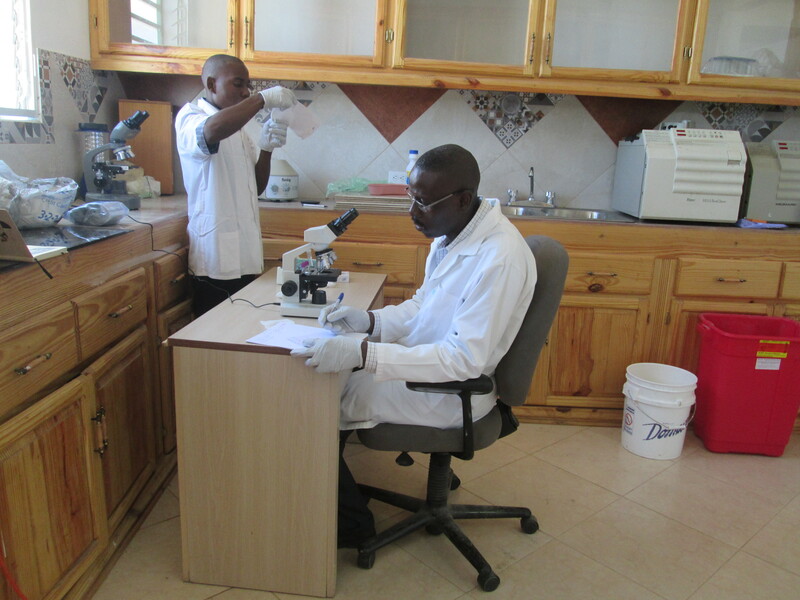 In the pictures that follow, you can even see the microscope and centrifuge donated by Espwa getting some use! 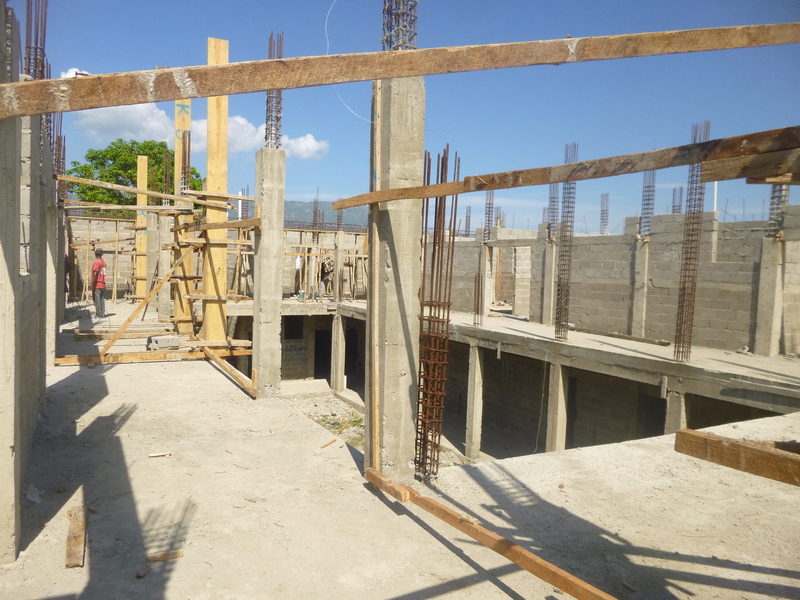 While we’ve supported the hospital construction effort, we know there is more work to be done. We hope to fill a sea container with medical equipment and other needed items in early 2017. Be on the lookout for how you can help in the coming months. 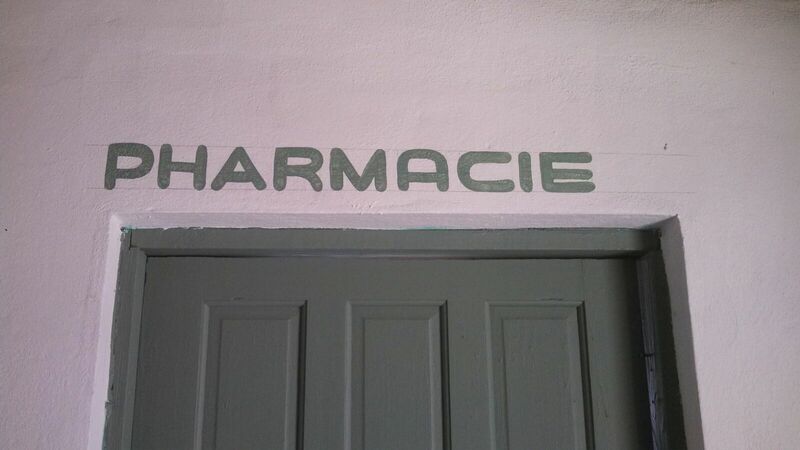 There was also a fundraiser started by one of our supporters who is trying to purchase an ambulance for the hospital (click here to see it). 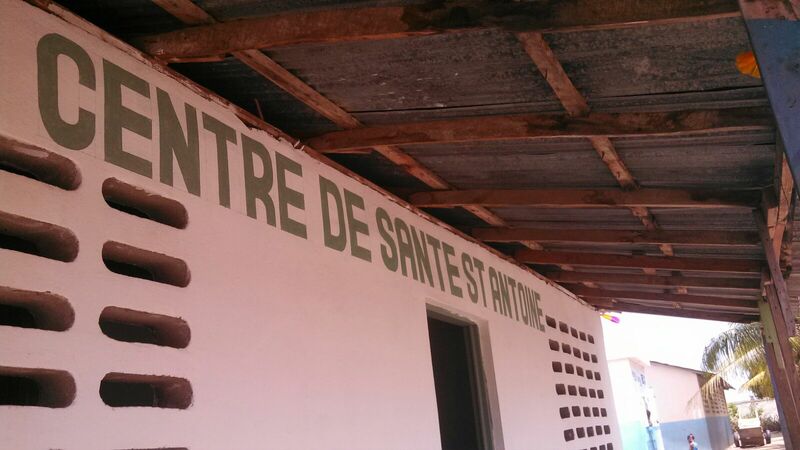 For a community that has never had access to legitimate health care, the hospital is a game changer. We want to ensure it has the tools it needs to remain sustainable for the long haul. 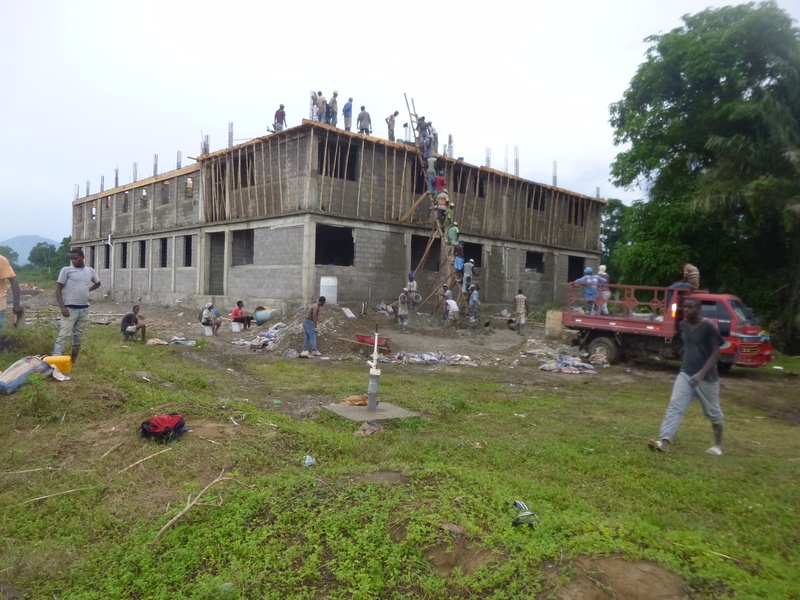 Can’t wait to send our first medical team down to support Doc and the new hospital next spring. 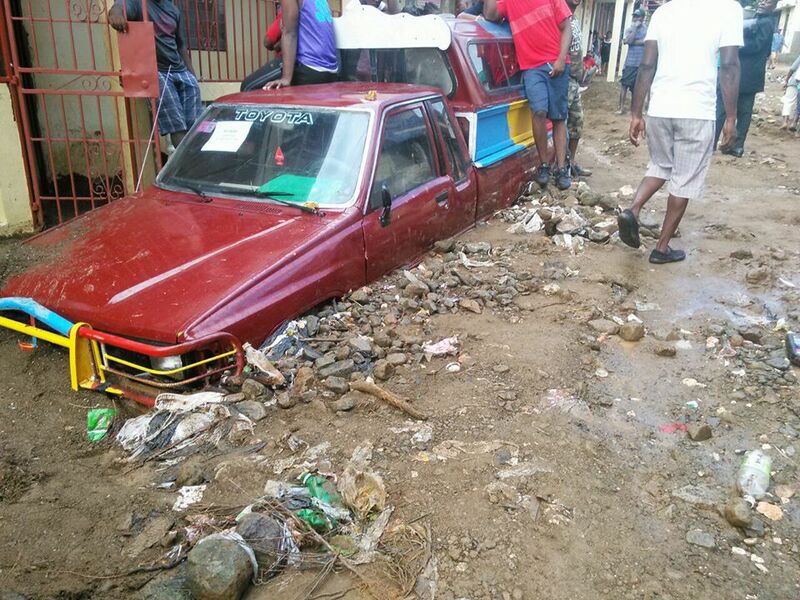 Just when you think that Haiti is finally on the road to recovery, natural disaster strikes again. 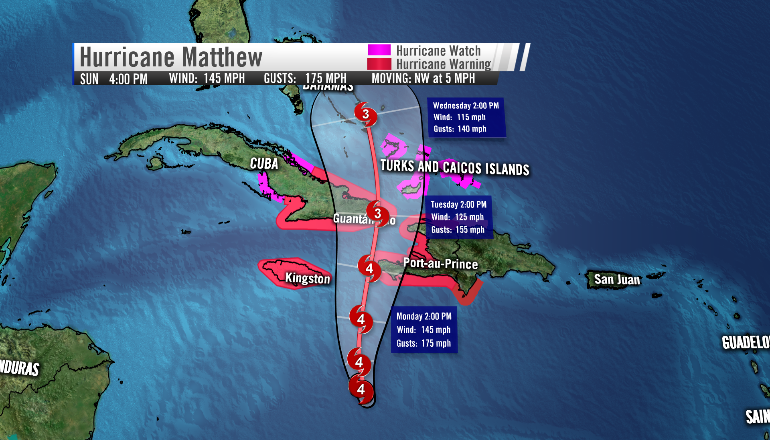 Hurricane Matthew ripped through the southwestern tip of Haiti before it continued on its path between Cuba and Haiti. 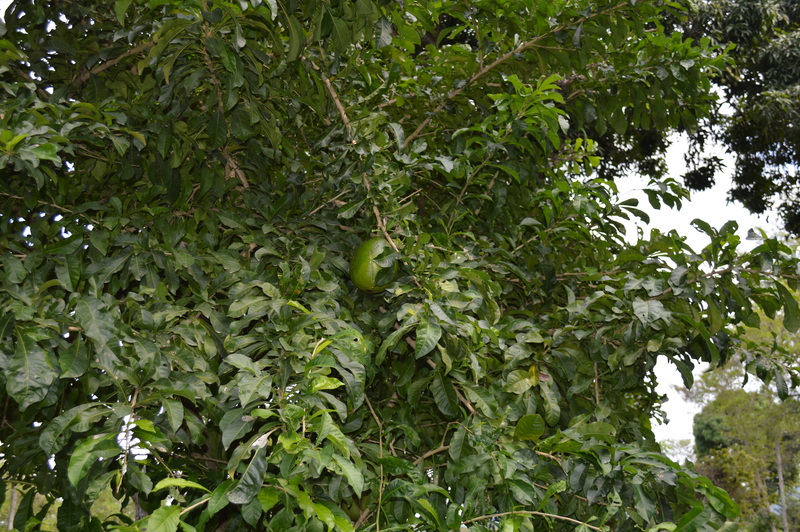 To date, there have been over 1,000 deaths, complete destruction of crops in some areas, and over 60,000 displaced. With such a dire situation in the south, it seems somewhat distasteful to tout our better circumstances up in the northwest section of Haiti, which was largely unaffected by the hurricane. 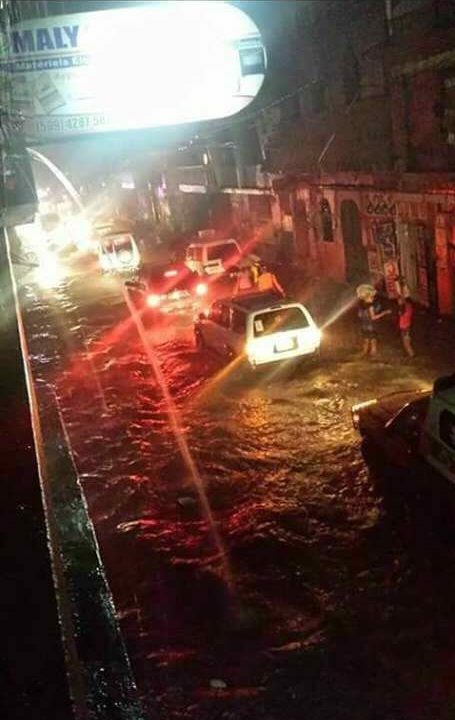 We have heard from our folks on the ground that everyone is safe, and that the city was mainly hit with heavy rains. 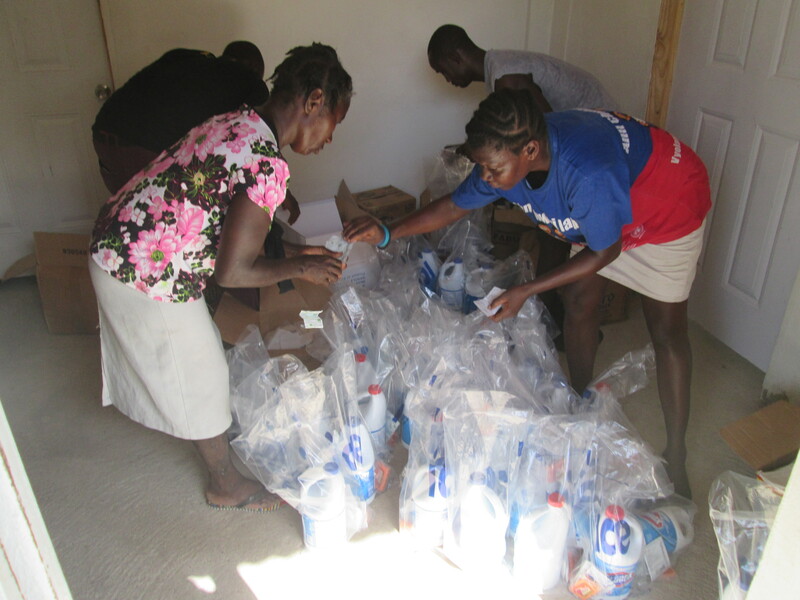 All we can say is praise the Lord for this blessing in a time of great need. Doc also asked for prayers and for any financial support that could assist with the fight against waterborne diseases. 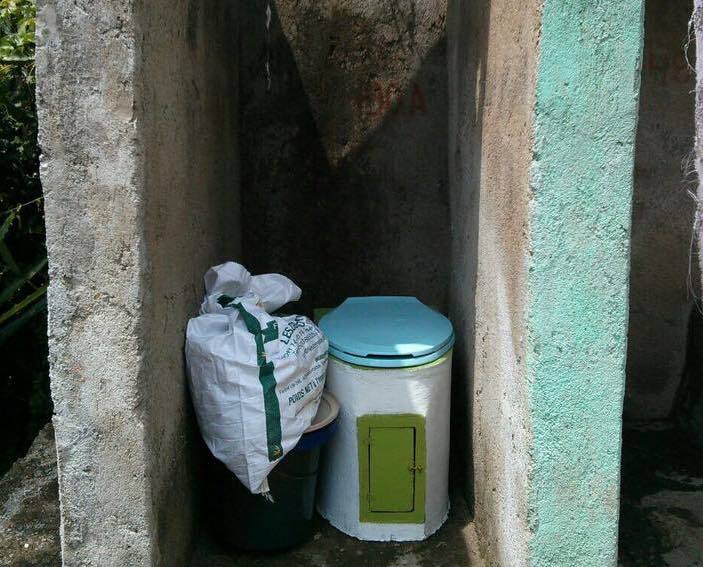 Without improved sanitation, excess rainwater causes sewage to mix with everything and people always get sick. 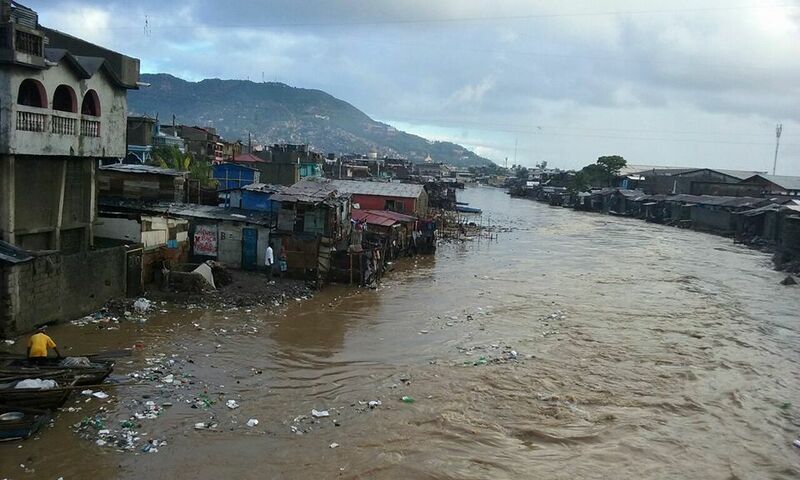 Unfortunately, we will continue to have this problem until the infrastructure of Haiti improves, to include better sanitation systems and more effective rainwater runoff areas. 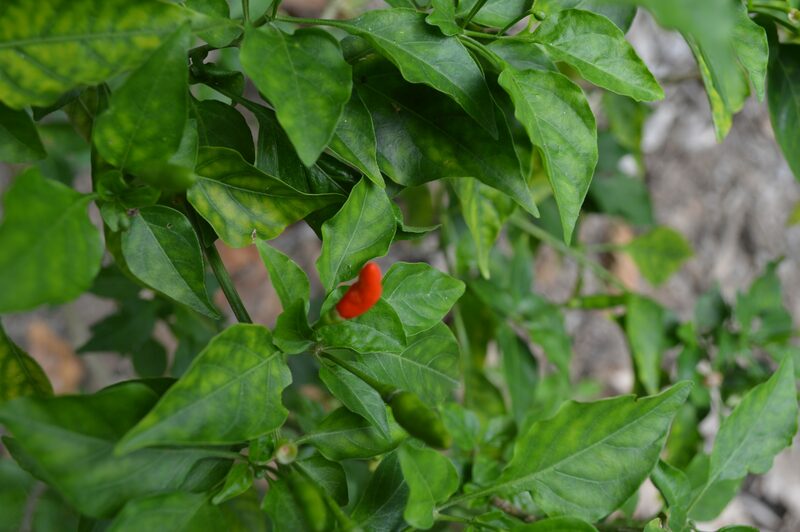 The heavy deforestation in Haiti (caused largely by the desire to make charcoal for personal use and for sale) has had many third order effects, and this happens to be one of them. 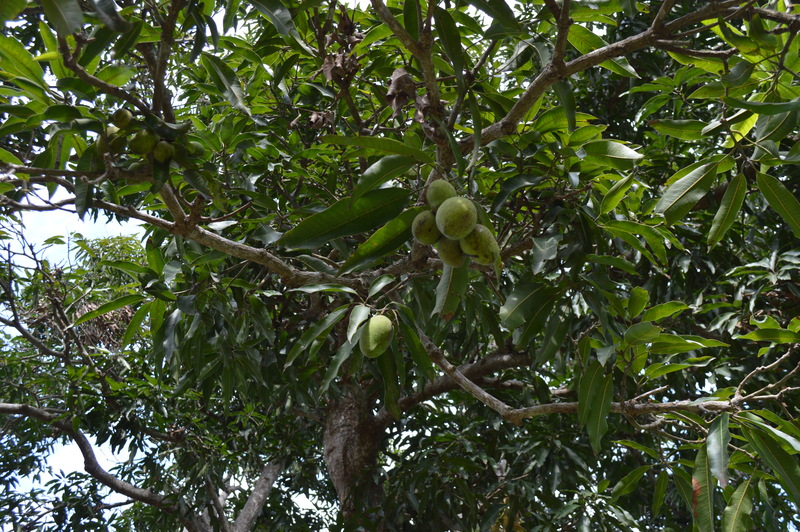 Without the needed trees that absorb much of the runoff, water and mudslides plague the mountainous areas. 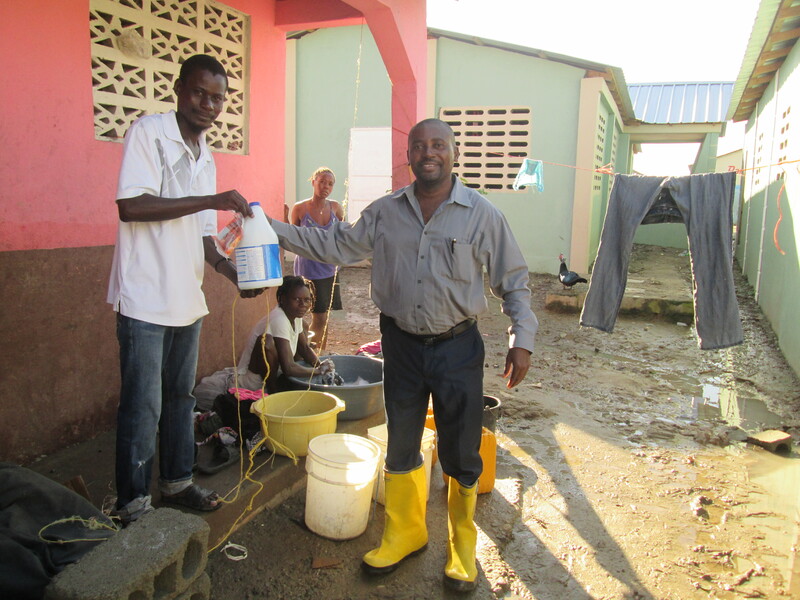 Even before the recent rains, Dr. Eugene has been passionate about fighting cholera. 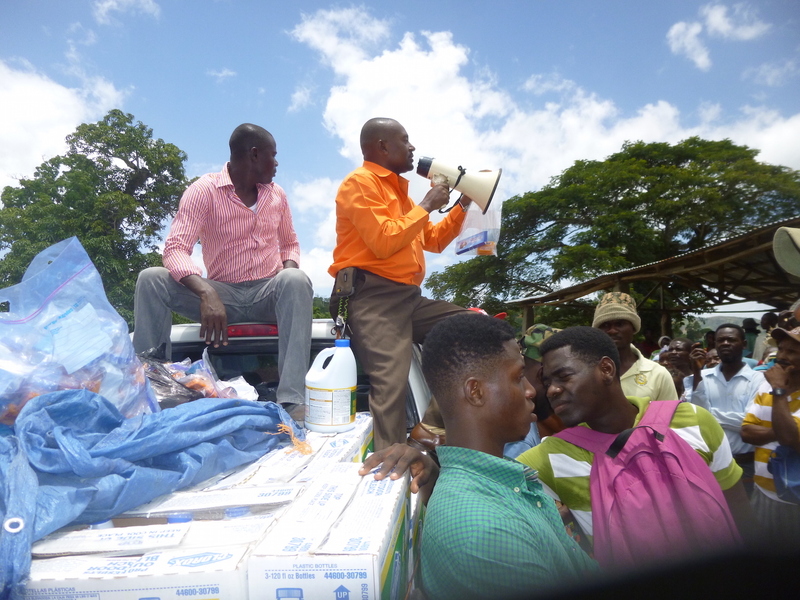 He’s traveled to many neighboring regions to distribute sanitation supplies, such as chlorine, soap, hand sanitizer, Aquatabs, and other hygiene items that prevent the spread of waterborne diseases. This time has been no different. 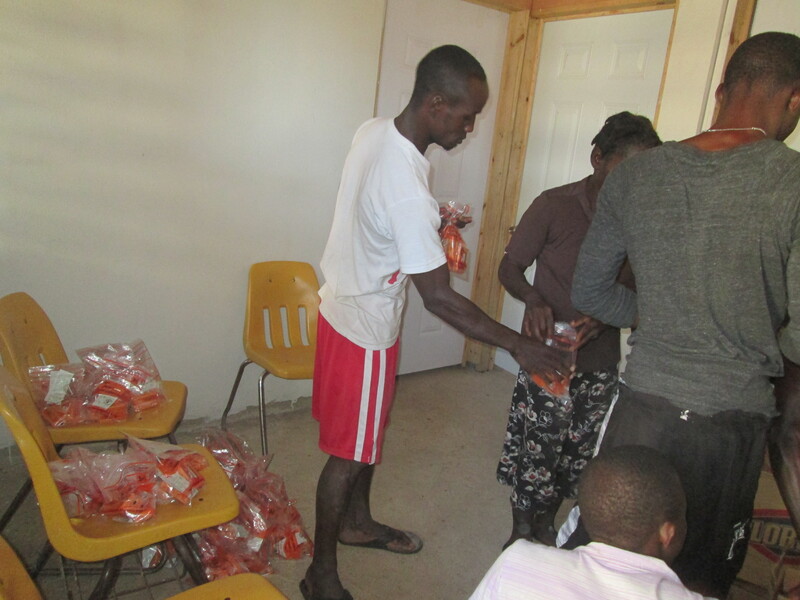 The photos below show his latest distribution for the community surrounding St. Anthony’s clinic, where he serves each Monday. We want to say thank you to all of the supporters who have and will donate to this cause. 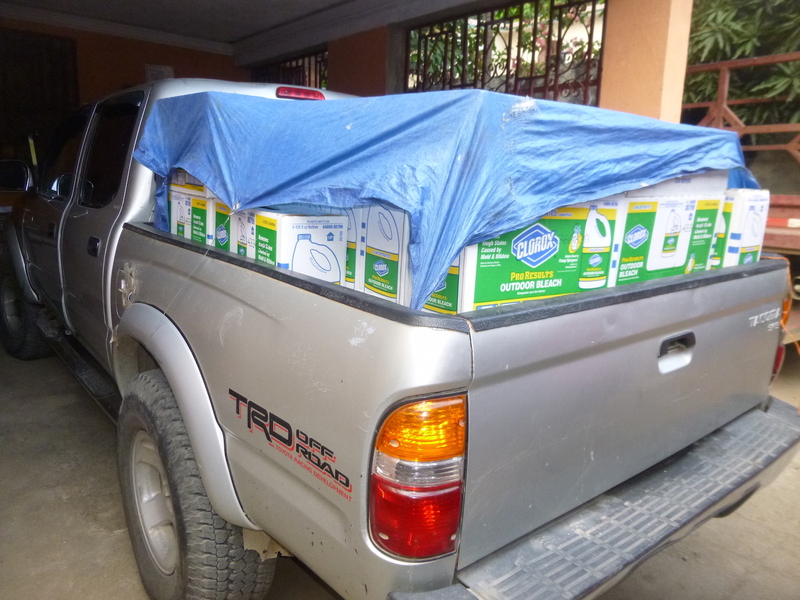 Through your efforts, Doc has been able to purchase the needed sanitation supplies and distribute them throughout the areas affected by heavy rains. Thank you again! For those of you who’ve been on a trip with us, you’ve likely been impacted by the loving smile and warm personality of Anne Lormeus. 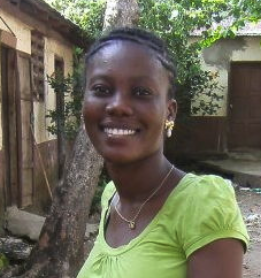 An EBAC graduate, Anne has translated for our teams, assisted on medical trips, and been part of several Haitian choir albums. 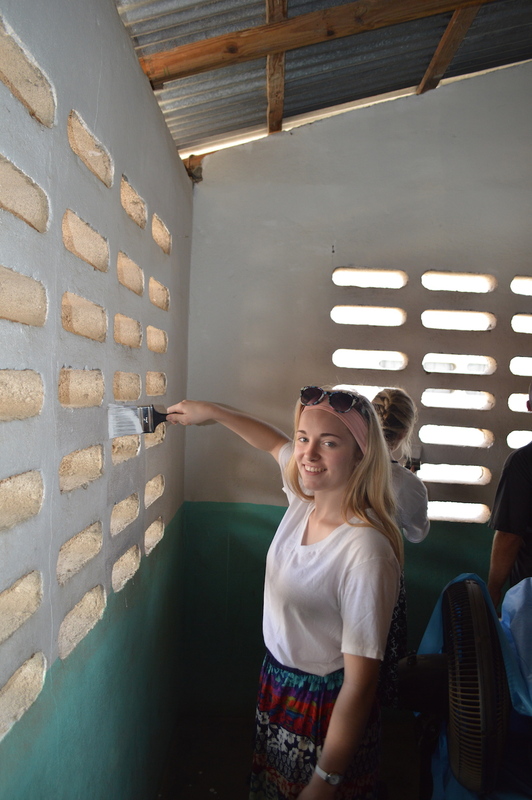 Anne now embarks on a new journey, pursuing an accounting degree in Port au Prince. 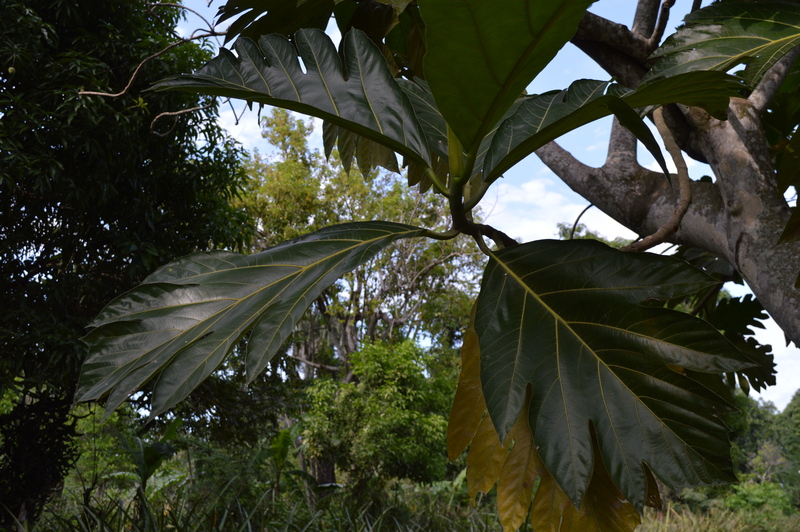 Espwa wants to see Anne succeed and has raised enough funds for her first year. We’ll be taking this a year at a time and monitoring her progress, but we expect big things. If you would like to contribute to her schooling, click on her photo. Funds received at this point will go to her second year. Thank you so much to Regan Kramer Media for this production. 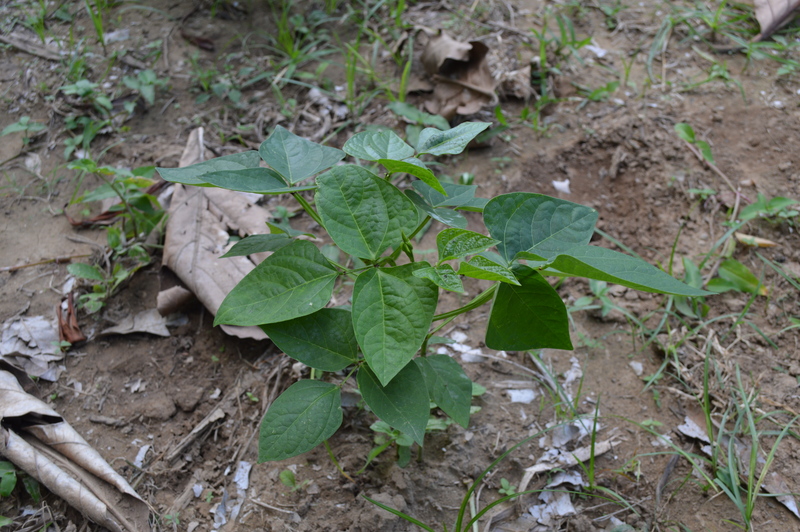 If you’d like to donate specifically to this project, please click the link below and designate your gift for “New Farm” at our donation site, Razoo. 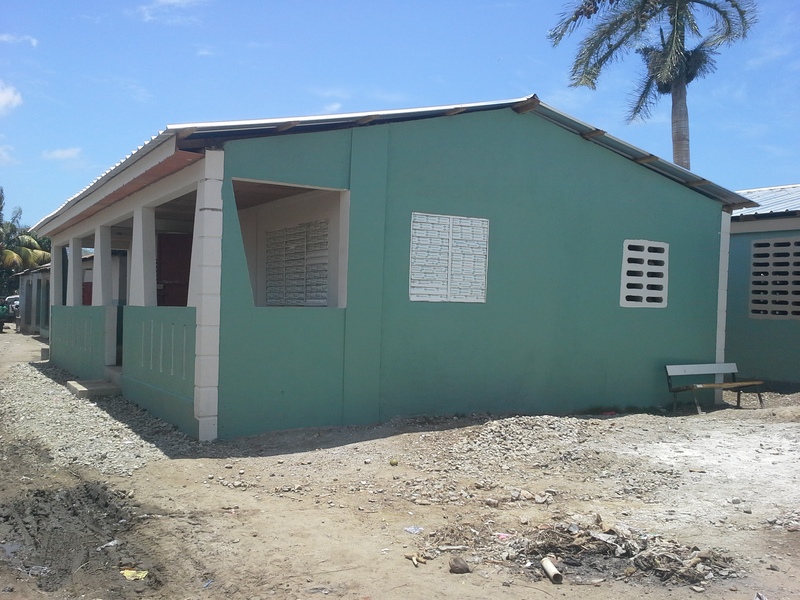 St. Anthony’s is one of the primary medical clinics at which Espwa serves in Cap Haitien, Haiti. 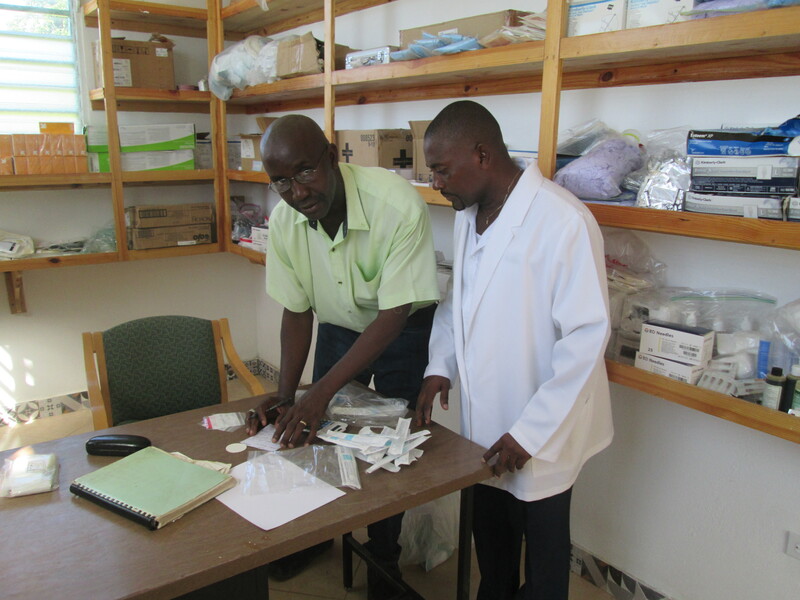 Our longtime friend and medical director, Dr. Eugene Maklin, sees patients there each week. 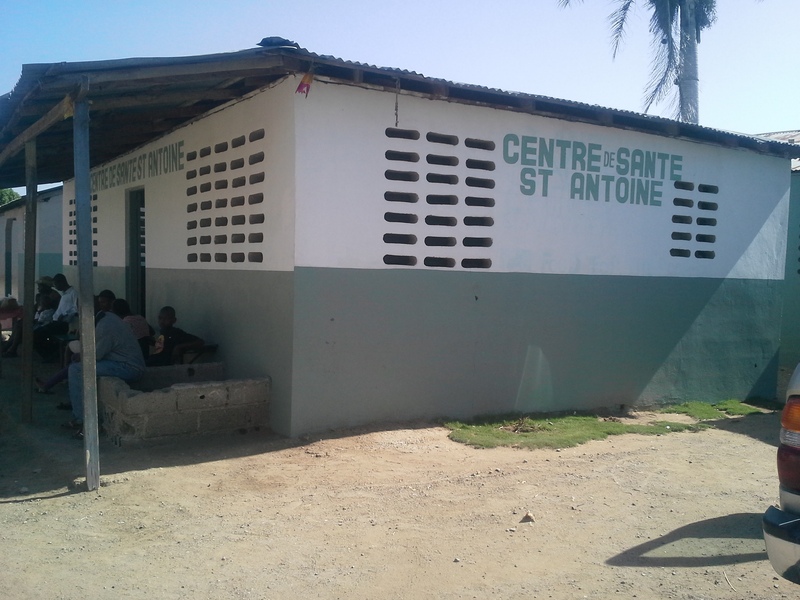 After this past March’s medical trip, it became clear that St. Anthony’s was overwhelmingly hot, overcrowded, and too small for effective patient exams. 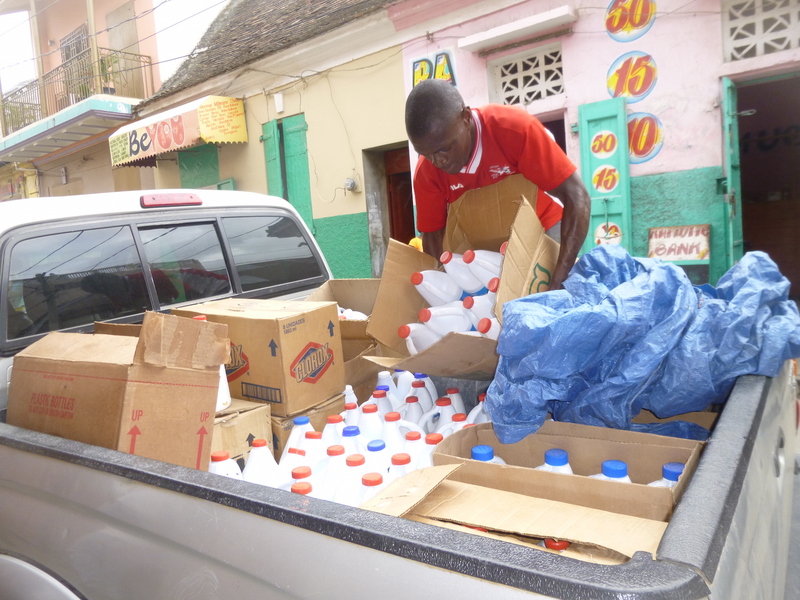 Between April and June, one of our network partners, Food for the Poor, was able to raise the capital needed to address some of its shortcomings. 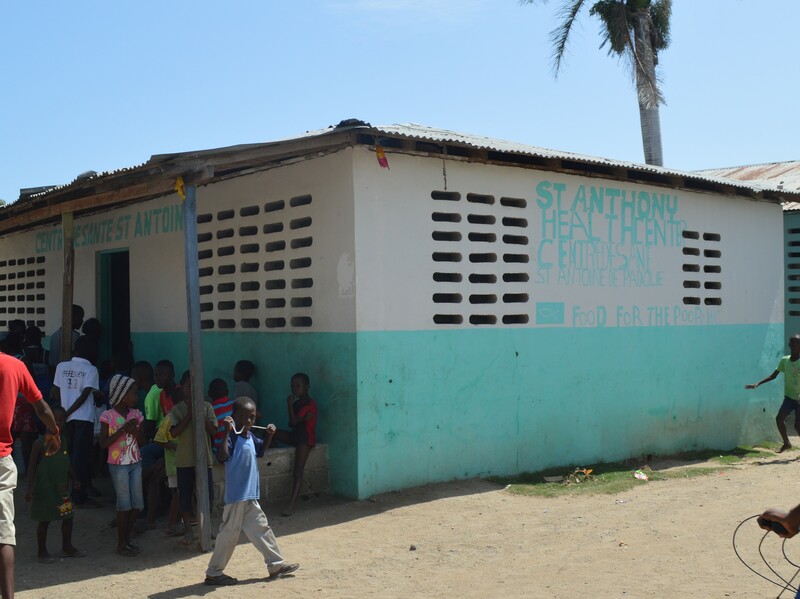 We can’t wait to return and serve at St. Anthony’s on our next medical trip and are so excited that community residents have such a nicer clinic! 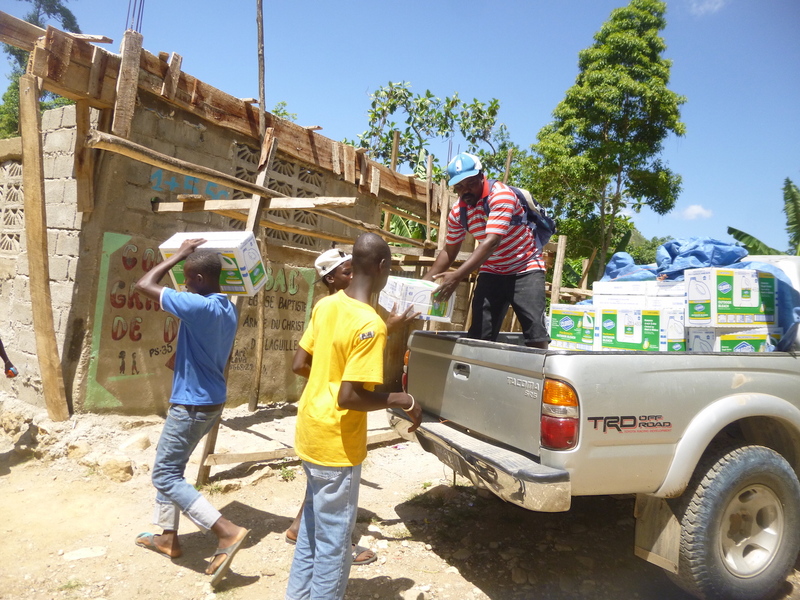 We’re fresh off our latest trip to Cap Haitien, Haiti, and like with most trips, we’ve returned with even more motivation for the work we do for the Haitian people. 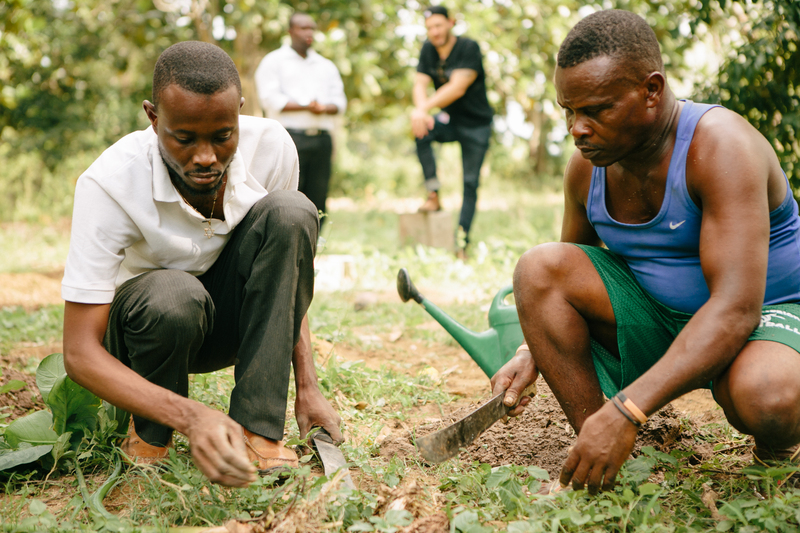 Through medical care, family support, farming, and small business, we are grateful for the opportunities we have to build relationships and impact lives. 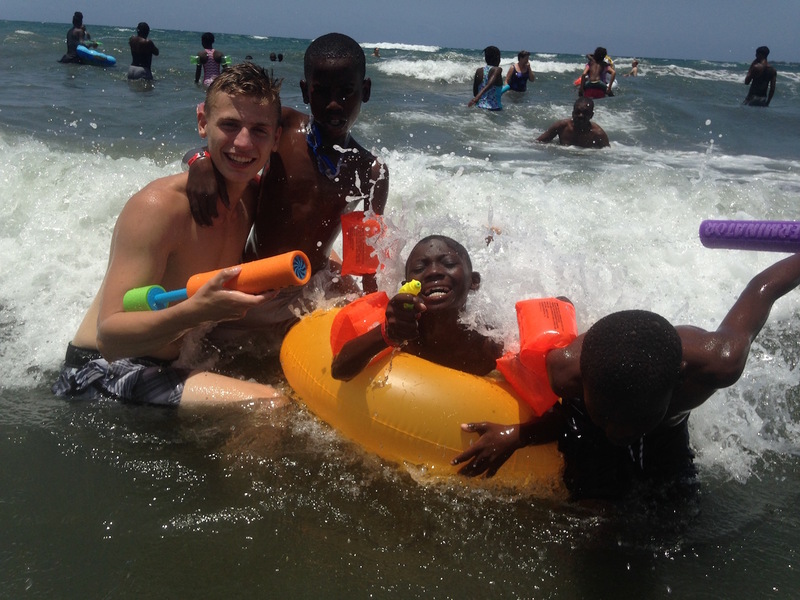 Check out the short recap video below, and keep reading for more details about the trip! The team set off to Haiti on March 9th, carrying more than 19 suitcases of medications, vitamins, and medical supplies valued at over $22,000. 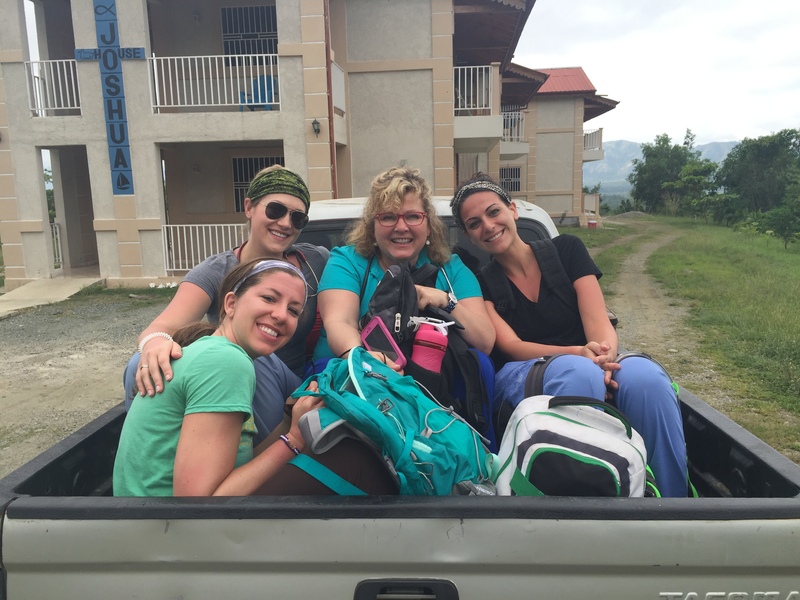 Five members of the Espwa leadership team (Jen, Chris, Joe, Brady & Kristin) were excited to be back in-country, but we were also privileged to assemble an amazing team of medical professionals, including two Nurse Practitioners, four RNs, and an Occupational Therapist. Another member arrived midway through the trip, bringing our team total to 11 individuals. 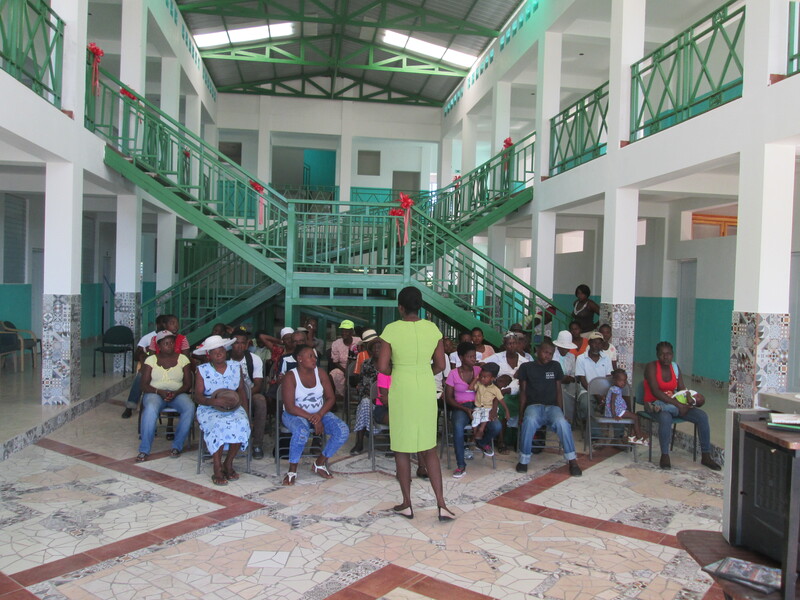 Our primary goal for the trip was to serve Haitians through medical care, with a secondary goal of meeting with the liaisons for our other Espwa projects to check progress. 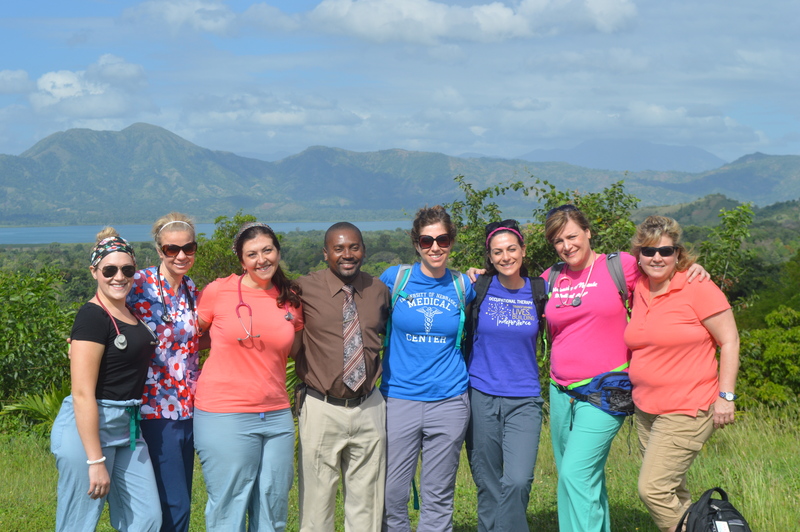 The medical team worked side-by-side with two Haitian physicians, Dr. Eugene Maklin (Espwa’s in-country Medical Director) and Wislyn Avenard, and began by serving for two days at the Blue Hills community. 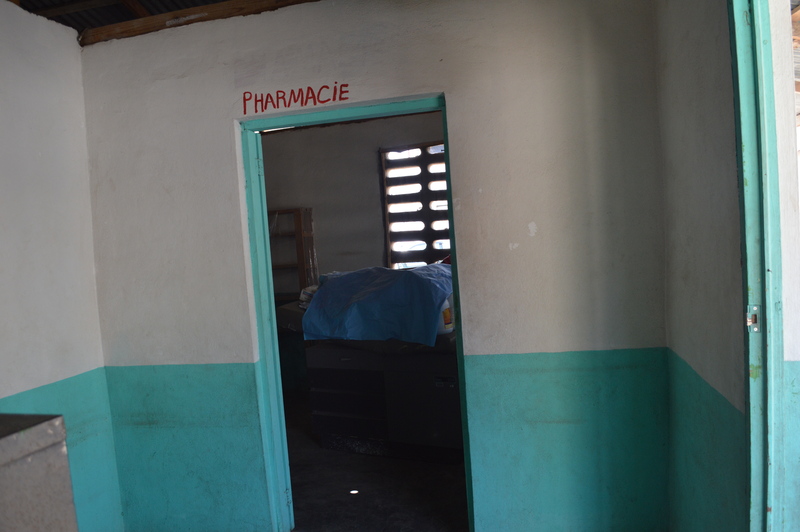 While there is no clinic in the small community, our team was able to set up shop in a school building run by Thomas Dieuseul and his wife. 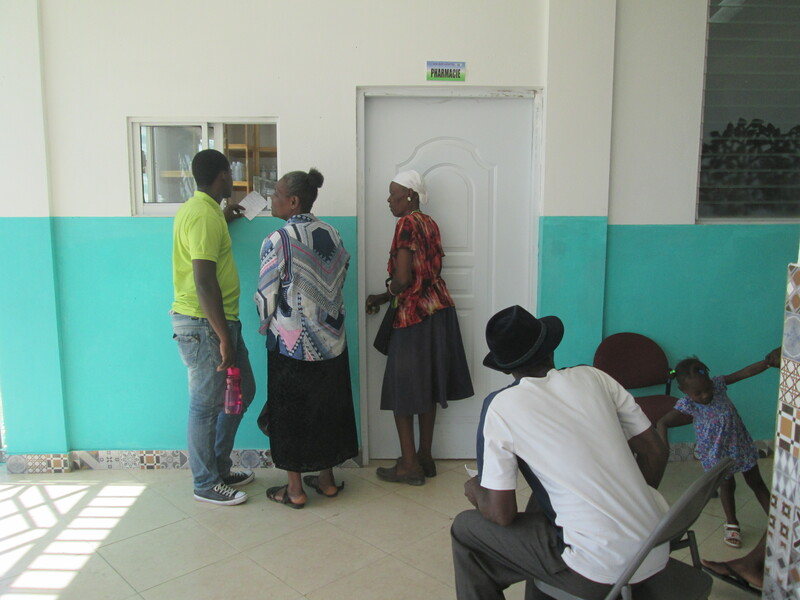 Patients began arriving first thing in the morning in order to reserve a spot in line to be seen by the team, and the waiting area was soon filled to capacity. Over two days, the team saw more than 300 patients, treating them for conditions ranging from dehydration to skin abscesses. 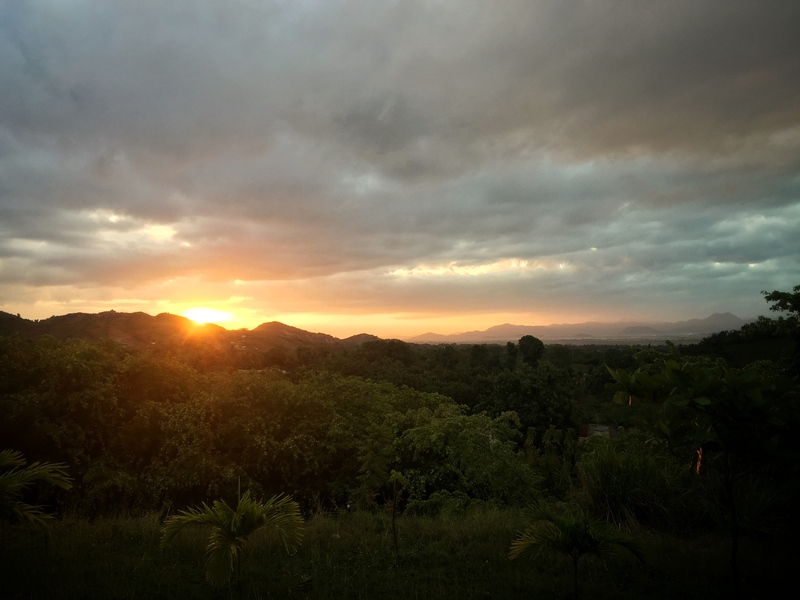 The team took a break from medical duty over the weekend, which gave an opportunity to experience some of Espwa’s other projects and to enjoy Haiti’s beauty. 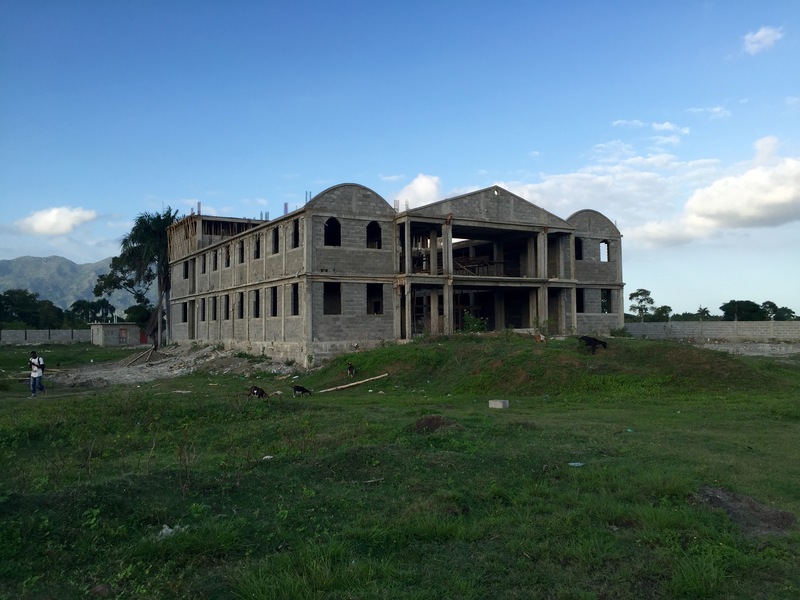 The team was very impressed by the amazing progress of Dr. Maklin’s New Hope Hospital (read about the story here). The building now has full three floors and is in the process of getting its roof, with a hopeful opening date in the July 2016 timeframe. On Saturday, the team met our Peace & Joy Families, who had assembled for their monthly meeting with our project liaison, Paul Guerrier. 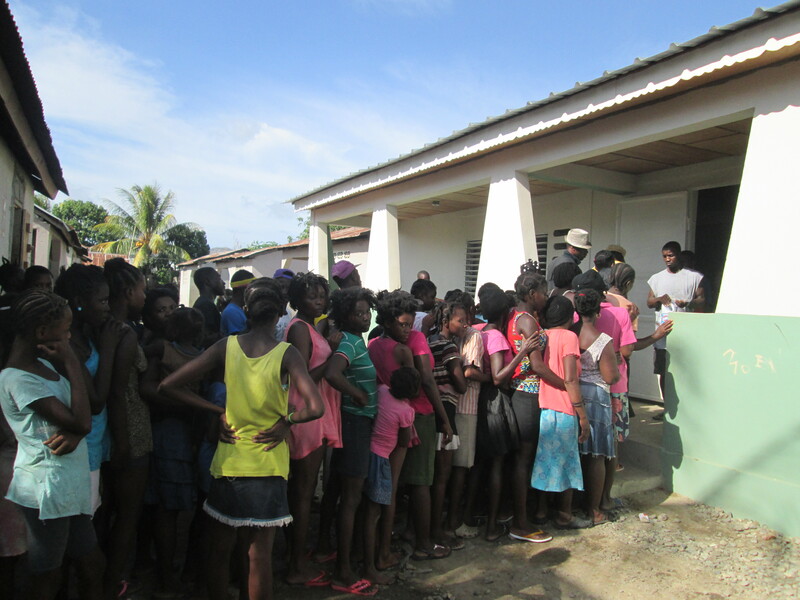 Pastor Benjamin Fleurant, who ministers to the families, was also at the meeting and led the children in a song while the team watched. 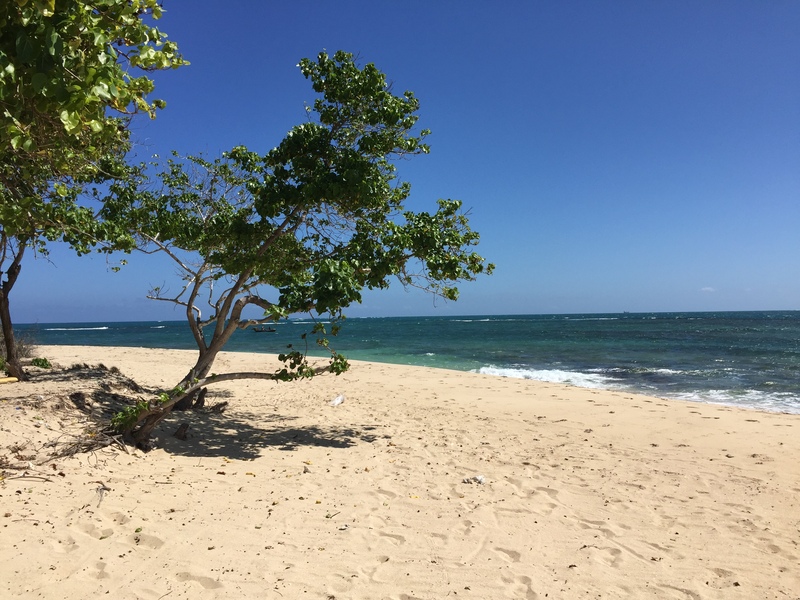 Sunday was a wonderful day of rest, in which the team spent the morning at Friendship Island – essentially a private island off the coast of Haiti (thanks Haitian Creole Tour!) 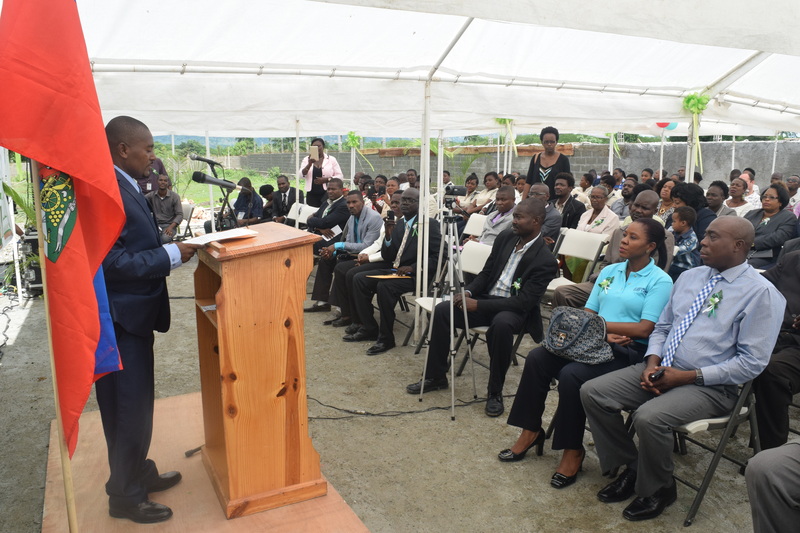 – and several members even ventured to city central for church services in one of Cap Haitien’s oldest cathedrals. 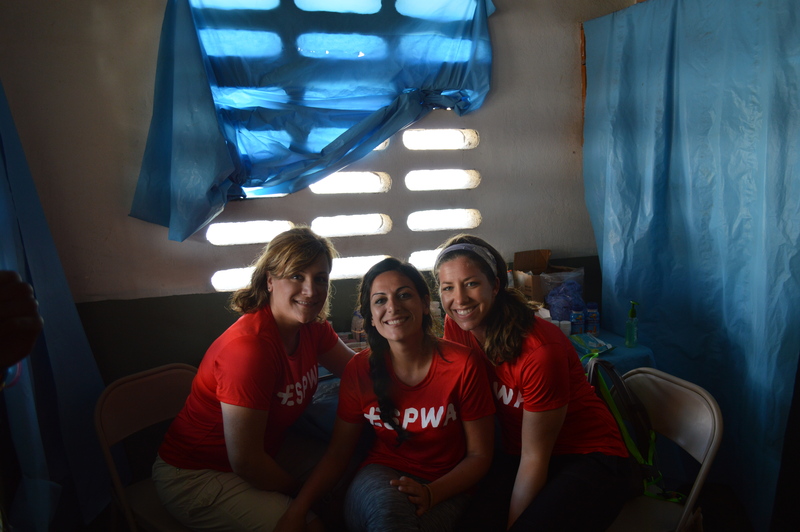 While most of the team provided medical care, our non-medical members checked progress on several other Espwa projects. The team met with Pastor Benjamin Fleurant, who regularly meets with our Peace & Joy families for Christian discipleship and relationship building. In December, thanks to your support, we were able to purchase a welding generator for him that has dramatically helped his ability to generate income and focus more on his church and his ministry to the Peace & Joy families. 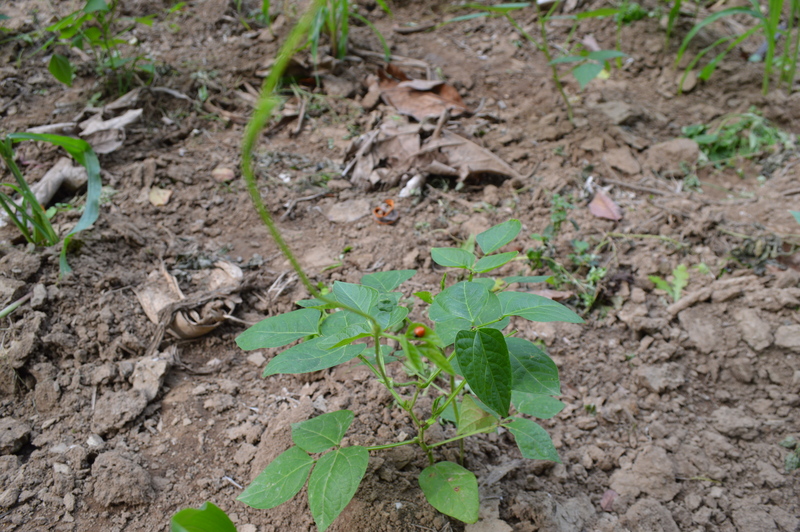 We met with Jovenel Joseph Kenold, who operates one of our main projects – a farming initiative – and who now has his sights set on a larger farm with his Agrolide organization. 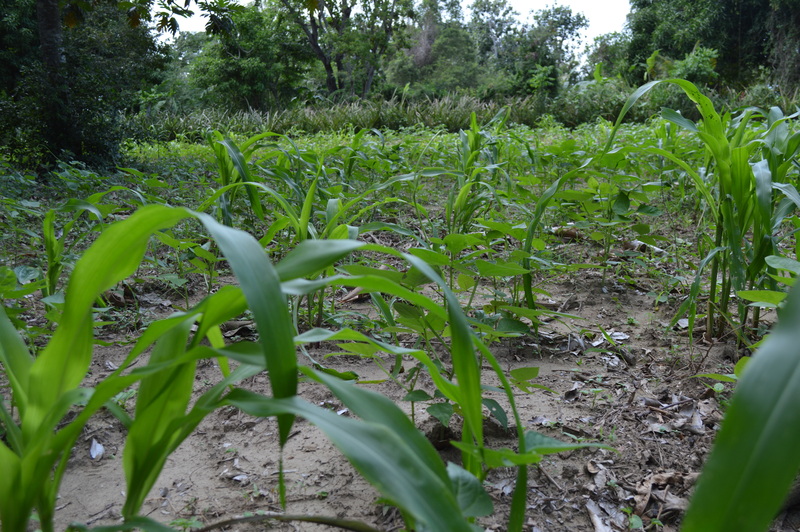 We explored some of the steps that need to be taken to make the next farm a reality. We also met with Paul Guerrier and Frantz Louis-Charles, who interface with our Peace & Joy families on a monthly basis, to discuss ways forward with small business opportunities in the future. 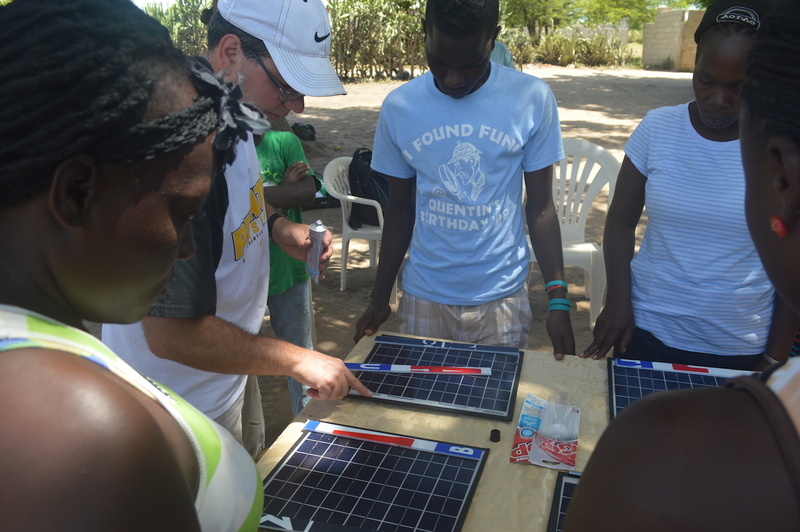 After 24 trips to Haiti since 2007, Chris Pfeiffer, Espwa VP, continues to learn valuable lessons with each trip. 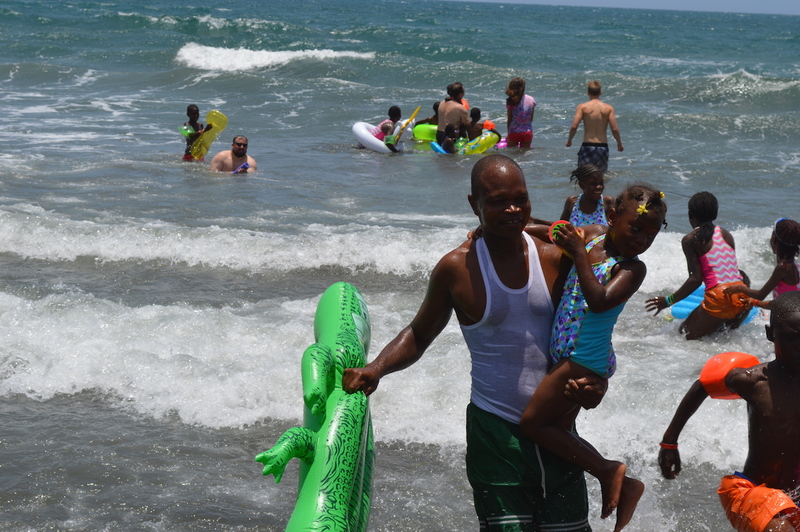 Chris says, “I see more and more value in time spent with our Haitian friends. Loving, caring relationships, built on consistency and trust, really matter. These take time, but are worth the effort. 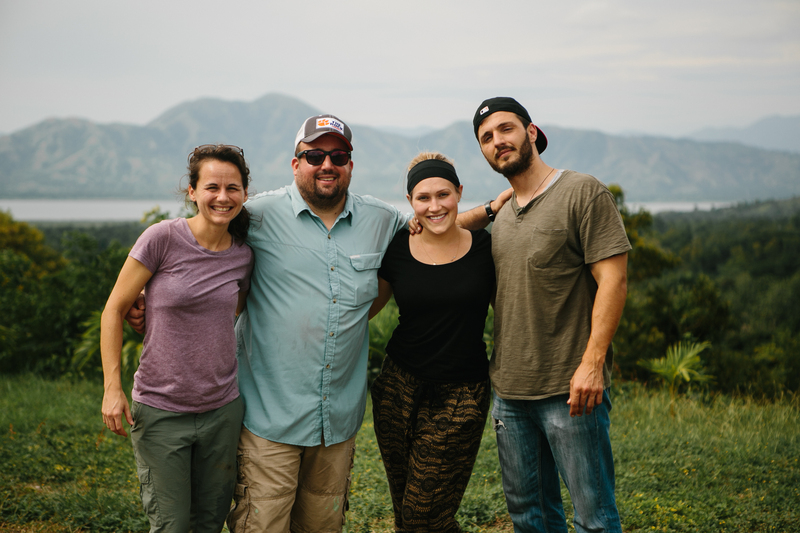 I’m more convinced than ever that these relationships are more important than “doing stuff” in Haiti or “bringing stuff” to Haiti.” This trip was just one more opportunity to show love and build relationships in Haiti. And while progress can sometimes be slow or discouraging, we’re in it for the long-haul. What an amazing 2015 we had! 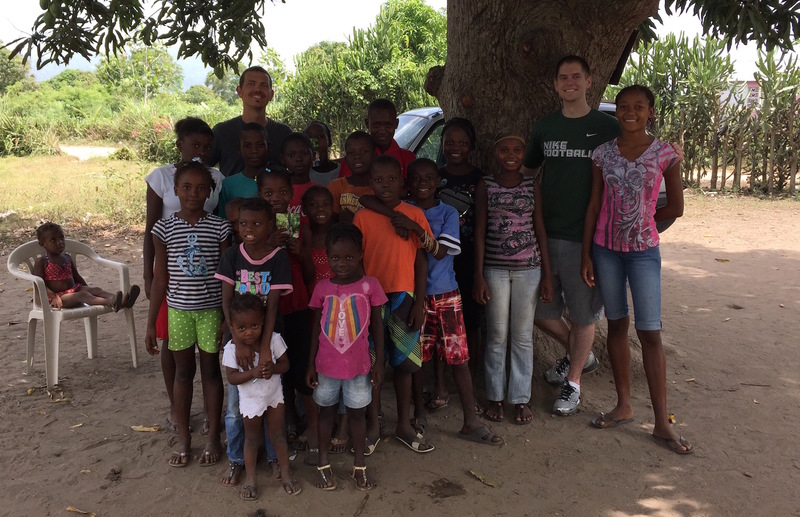 We ended the year with a great trip to Haiti in December. We sent a small team to accomplish one main objective – capture some new media (video & photos) for 2016. 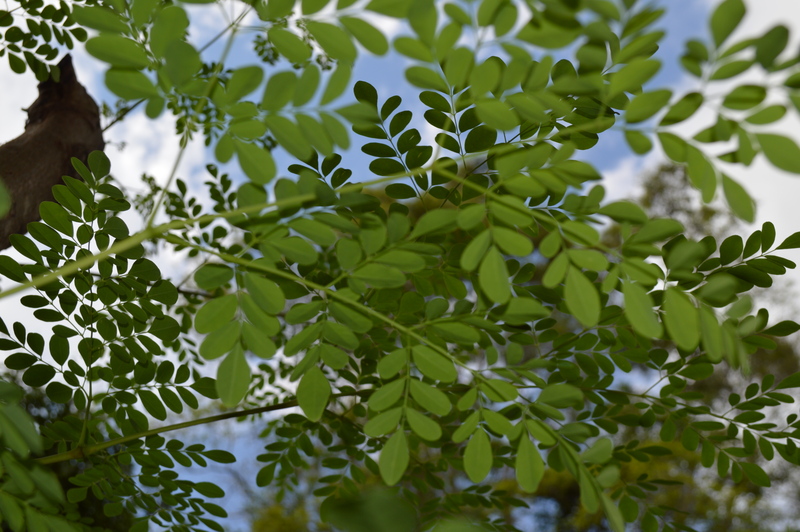 We took talented, south Florida cinematographer, Regan Kramer (see her website here). 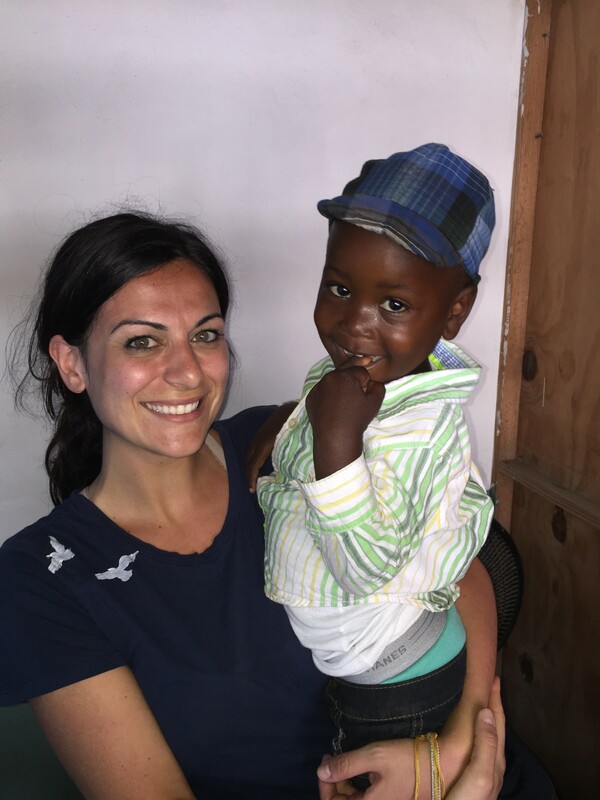 In the past year, Regan produced two wonderful pieces about our great friend and Medical Director, Dr. Eugene Maklin, and we hoped to capture another Espwa story on this trip. 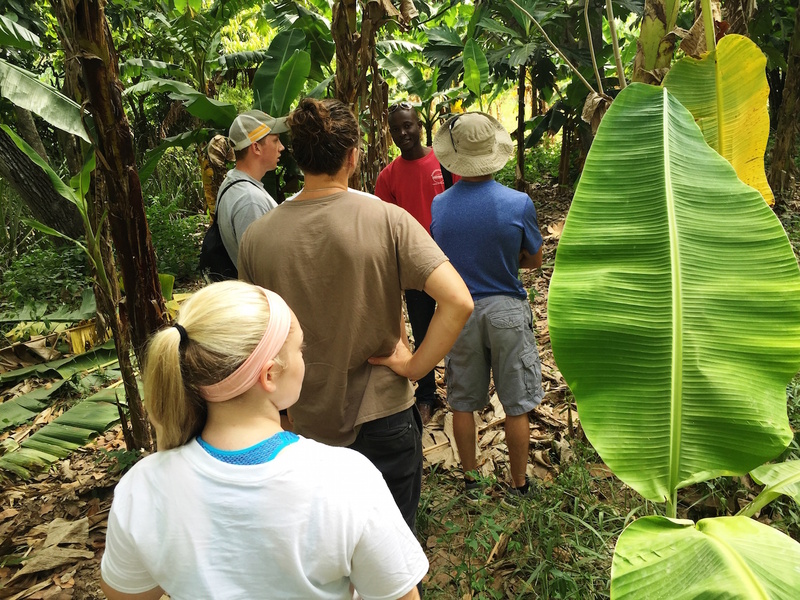 As you may know, one of our current projects involves helping Jovenel Kenold realize his dream of a bigger, more impactful farm that will employ locals, feed the hungry, and ultimately share the love of Christ in Haiti. Several things have been put in motion with the new farm, but due to the size, there is a great need for start-up capital. 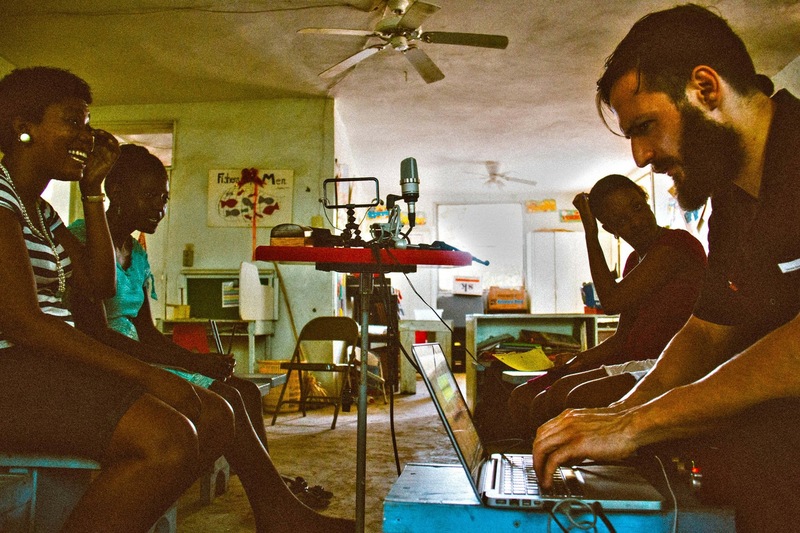 We filmed Jovenel’s story, and watched as his passion and vision for the project shined through. We plan to use the footage to produce a short promotional film that will bolster Espwa’s support of the farm and raise additional funds. 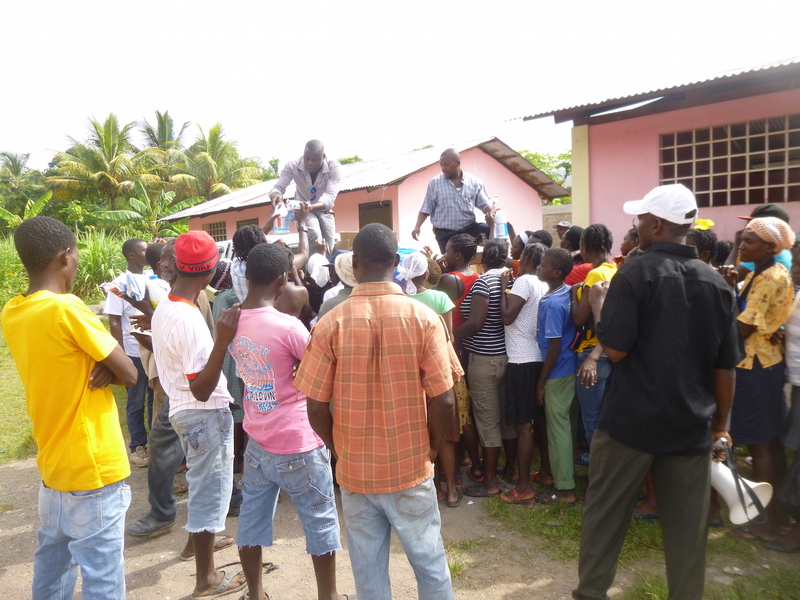 Stay tuned in 2016 for the new video sharing Jovenel’s story. 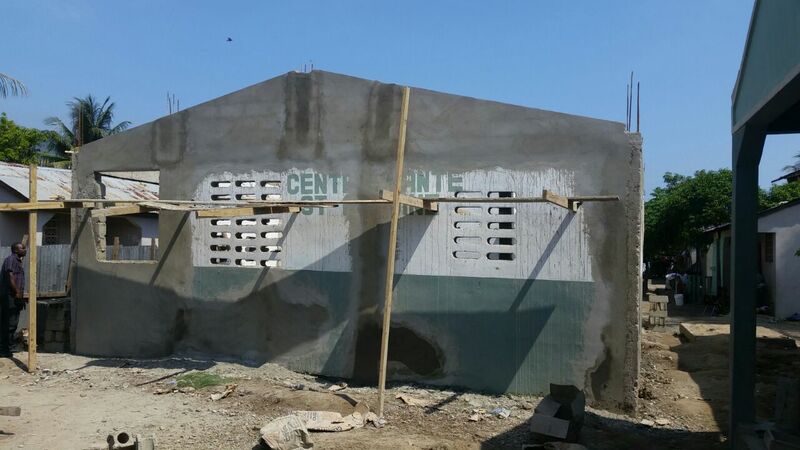 The Espwa team also got the chance to check up on some of our other current projects in Cap Haitien. 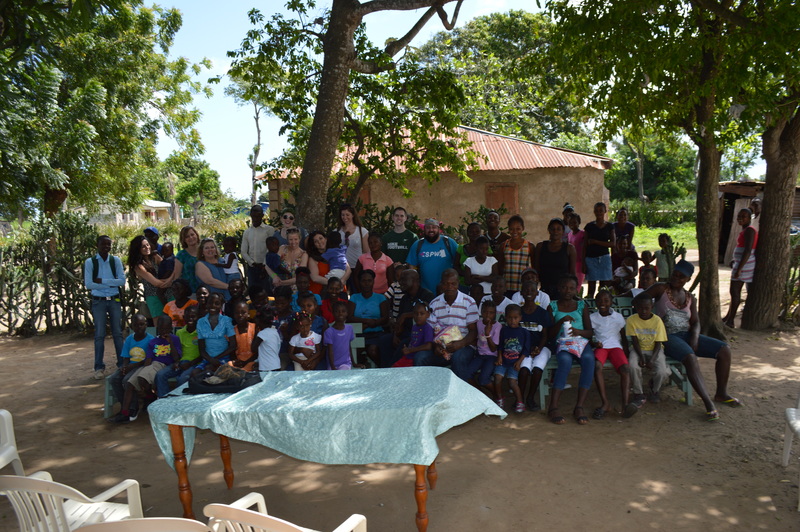 We visited with the families of the Peace & Joy Family Project (they are doing great! 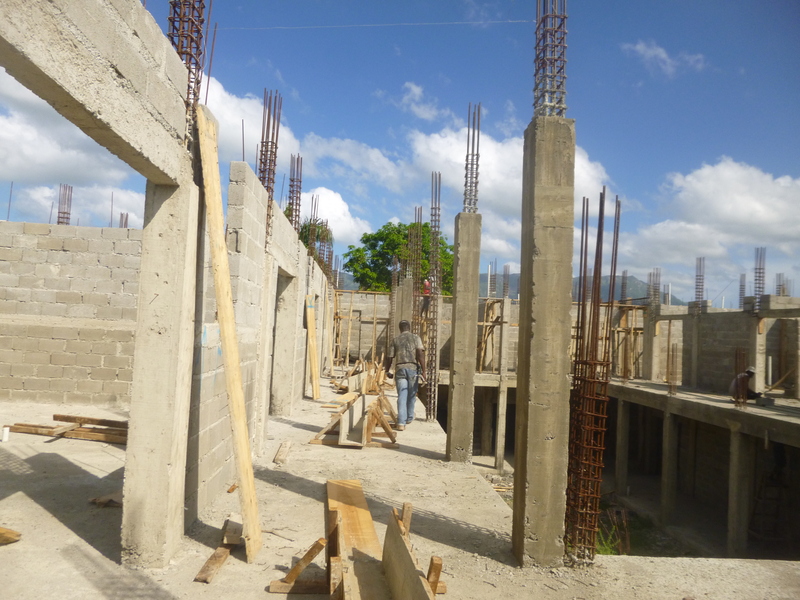 ), met with our good friend Frantz (of Haitian Creole Tour), saw the progress of Dr. Maklin’s hospital construction, and even spent some time at the plage (beach). 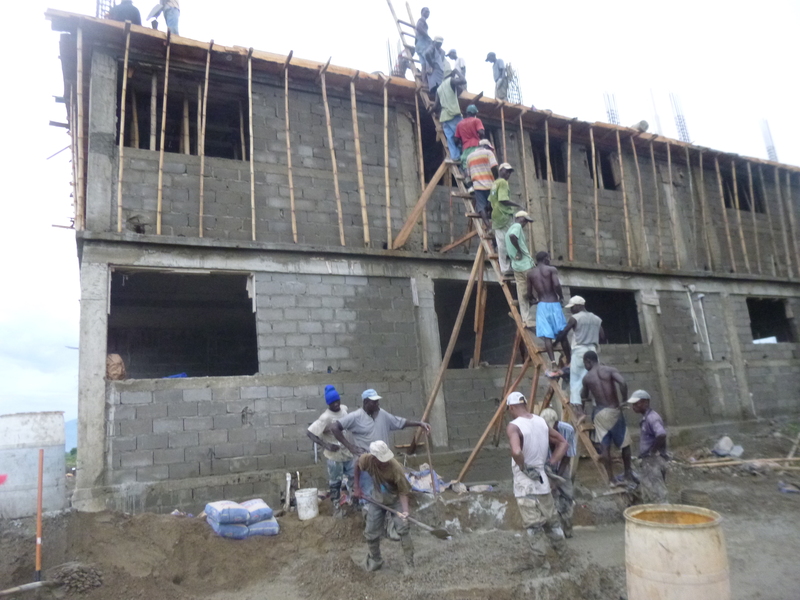 Thanks for following along as Espwa continues to serve our brothers and sisters in Haiti. We hope that 2016 will be our best year yet. We’re proud to announce that last month, through your support, we were able to fund the vital repairs to Dr. Eugene Maklin’s vehicle. 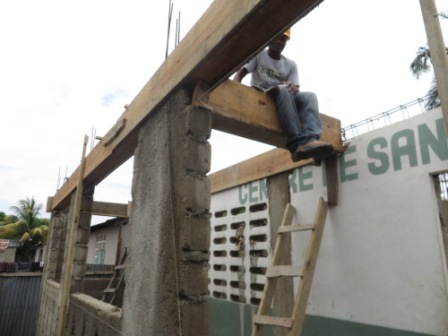 Dr. Eugene is a man like no other in Haiti, and we’re glad to have him as part of the Espwa team. We’re hoping that you’re aware of the good doctor’s hospital project, as it’s been featured on our Current Projects page for a few months now. For a good summary of where it stands at the moment, check out the video below. 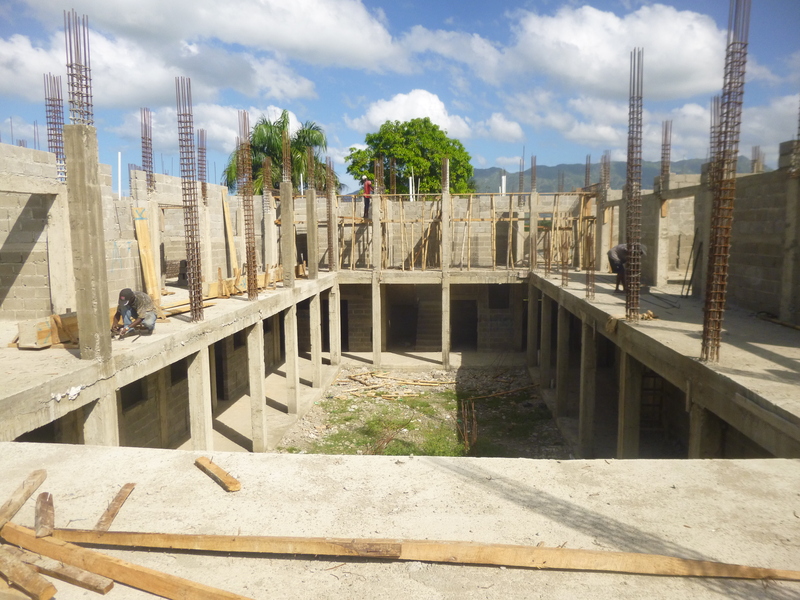 Suffice it to say that this hospital will make a huge impact in northern Haiti. 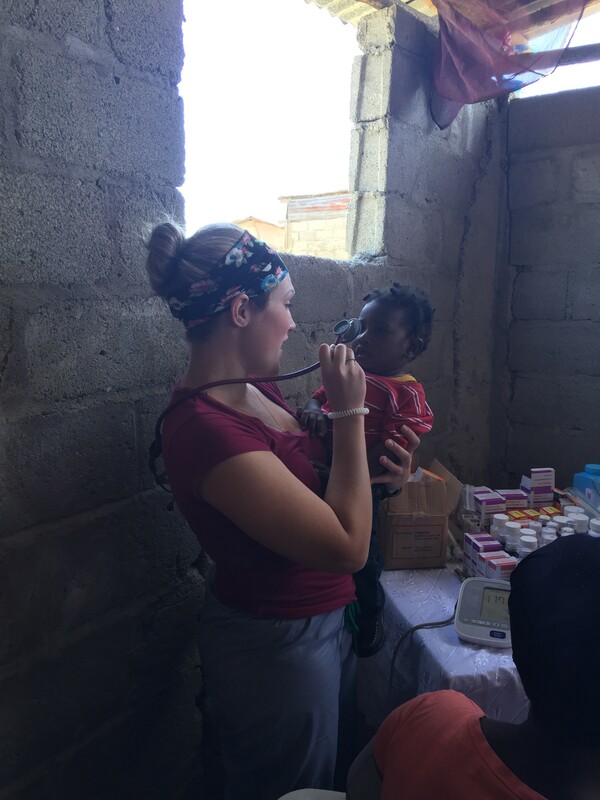 We’re excited to see Dr. Eugene’s passion come alive, and we look forward to the day when we can send medical missions teams to help out firsthand. 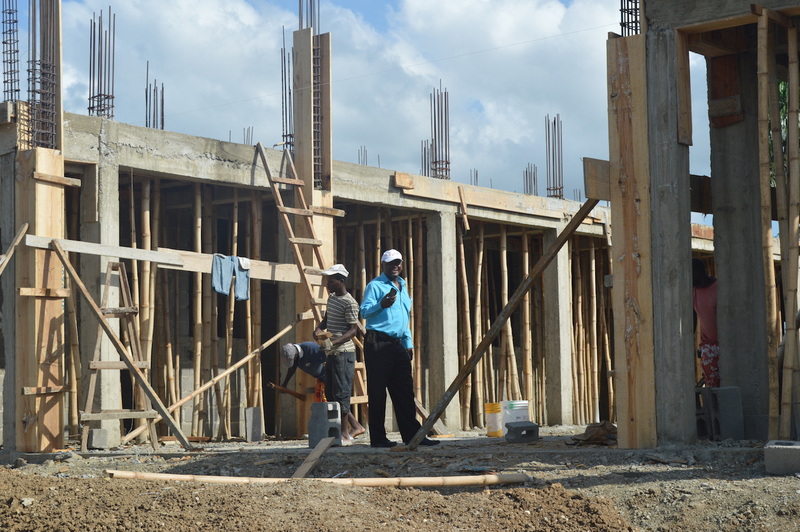 But as the video illustrates, the funding for construction has hit a plateau. 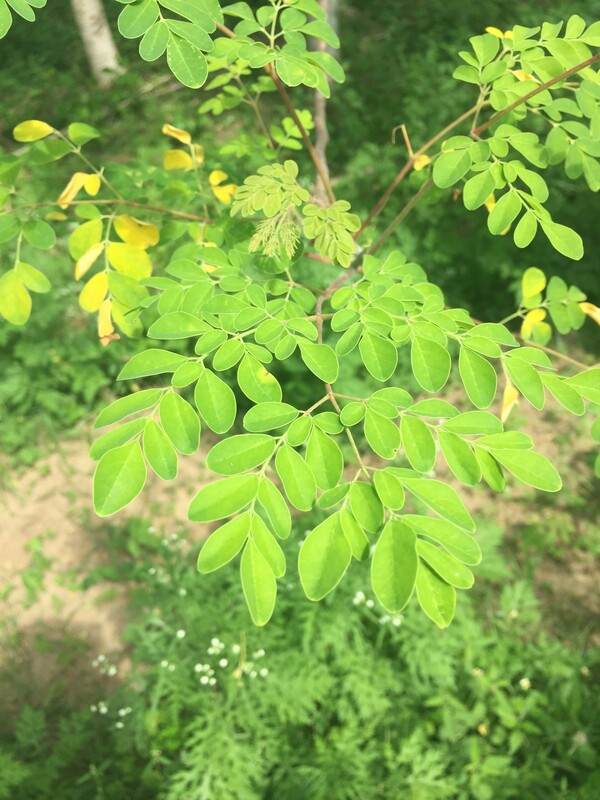 This week, Dr. Eugene finishes up a two week trip to the U.S., and a large part of the trip has been trying to generate additional support. 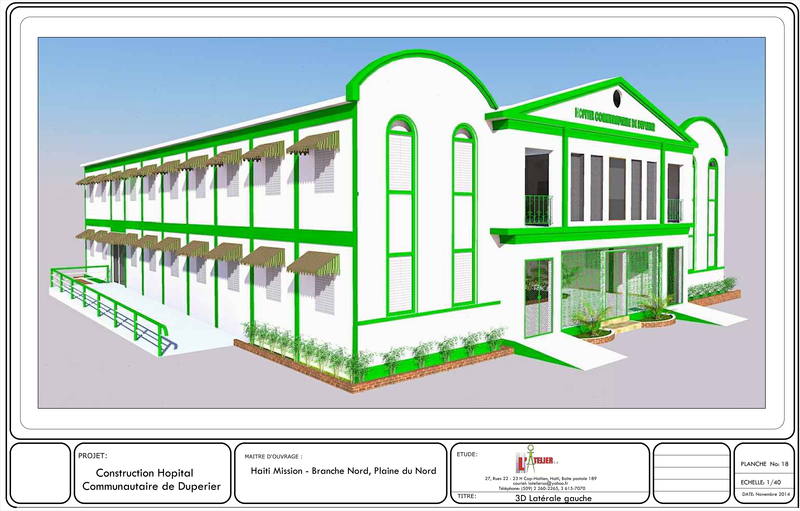 If you have a desire to aid in this life-changing project, you can earmark your donation to Espwa as “Doc’s Hospital,” or also donate on the Haiti Mission Branche Nord website. Thanks for everything you do Dr. Eugene! 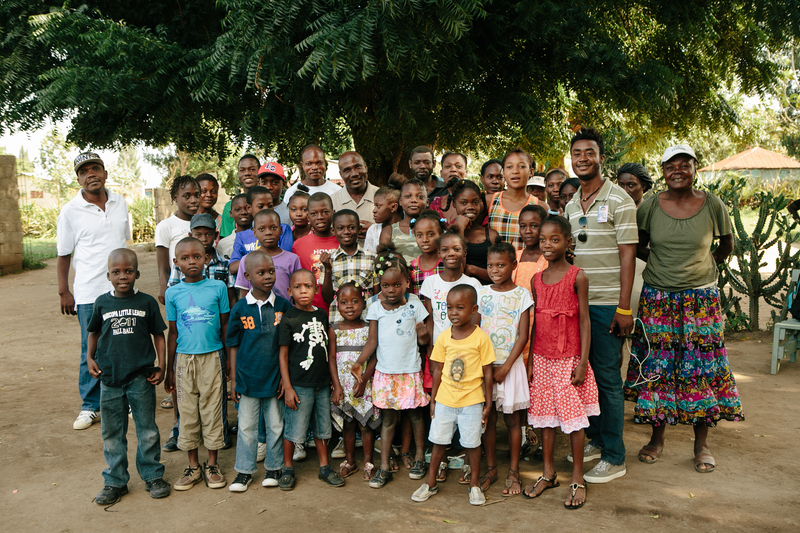 If you’re familiar with Espwa, you know that the Peace & Joy children are near and dear to our hearts. 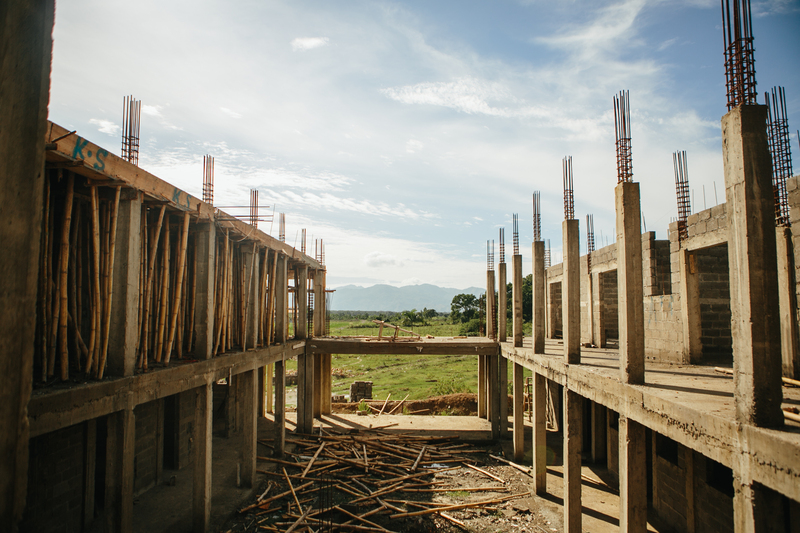 When we first encountered the orphanage several years ago, these kids were downtrodden, malnourished, couldn’t attend school, and had little reason for hope. Fast forward to present day and you’ll instantly notice a difference in their attitudes, demeanor, and outlook on life. 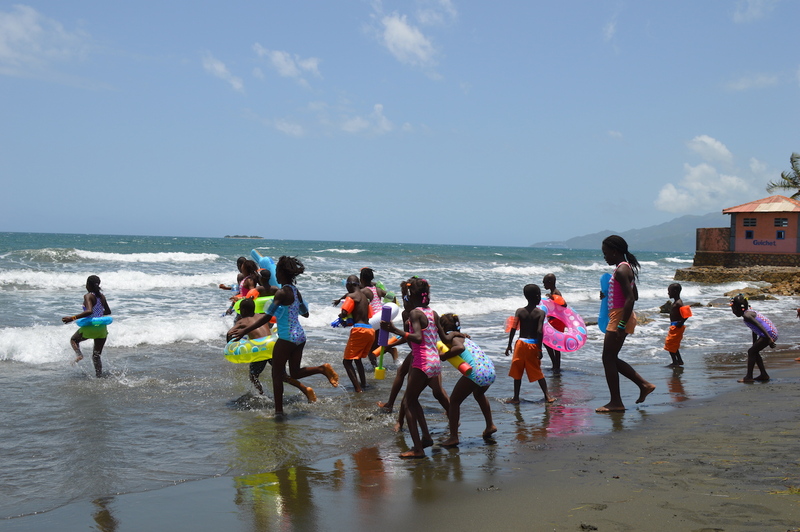 Back in loving homes, attending school, and with access to medical care, the children have flourished. We’ve always taken pride in these amazing changes, and this year is the first time we’ve felt that the project has hit a steady state. 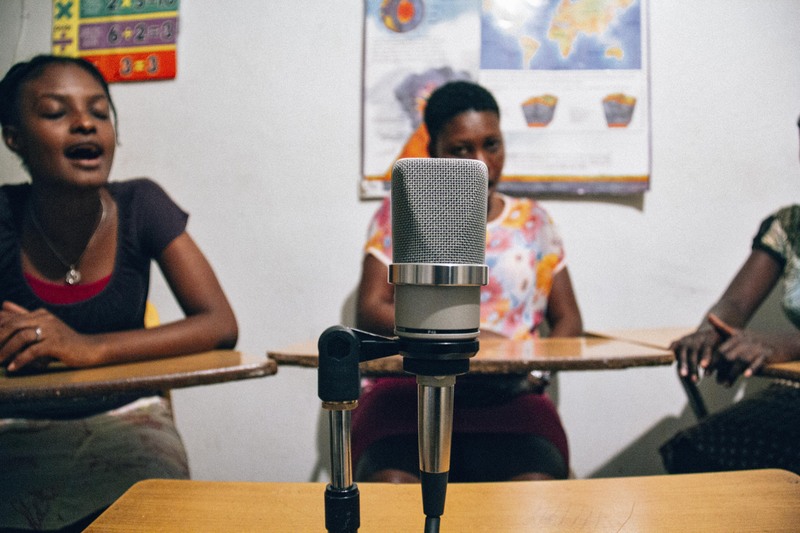 We’ve covered another year’s schooling fees, medical expenses, and are actively fundraising to continue providing a monthly stipend. We’ve built relationships with the families and they know we’re in it for the long-haul. 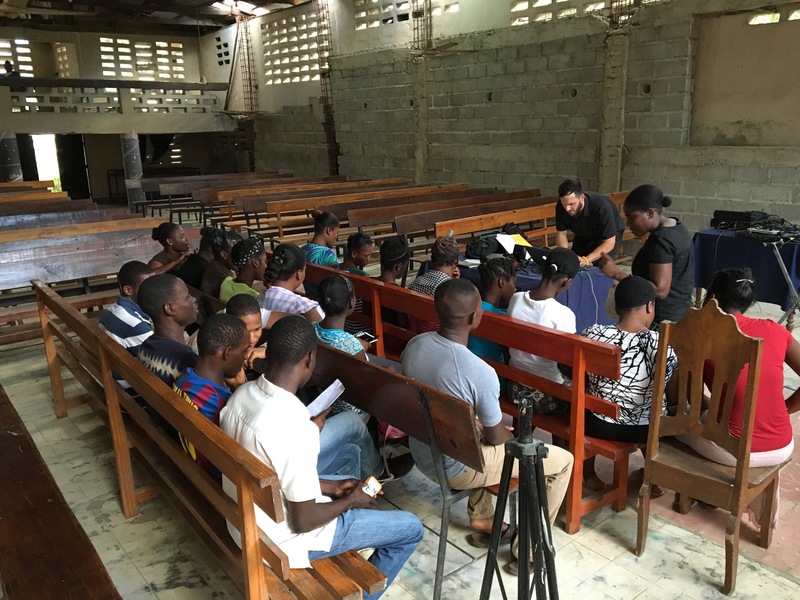 This February, we made a connection with Pastor Benjamin Fleurant of EBAC Church in Cap Haitien, Haiti. 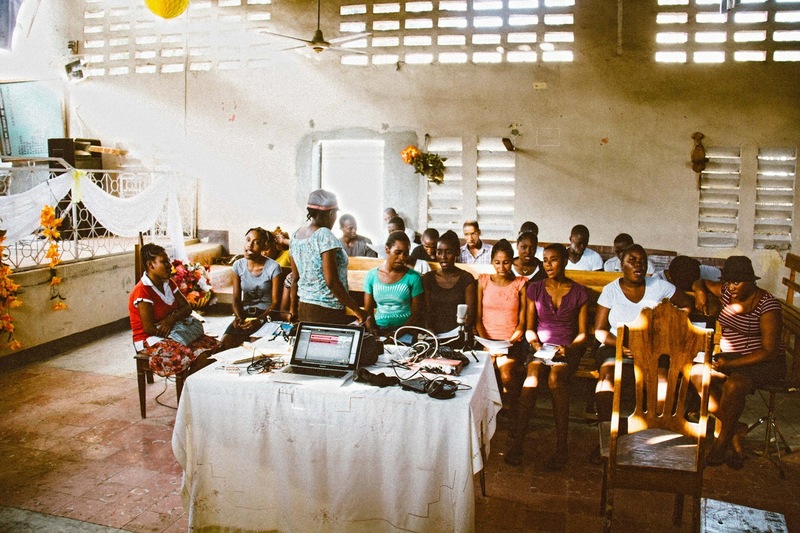 During our initial meeting, we asked Pastor Benjamin many questions, but one stuck with us. We’d been searching for opportunities to impact the Peace & Joy families in new ways. 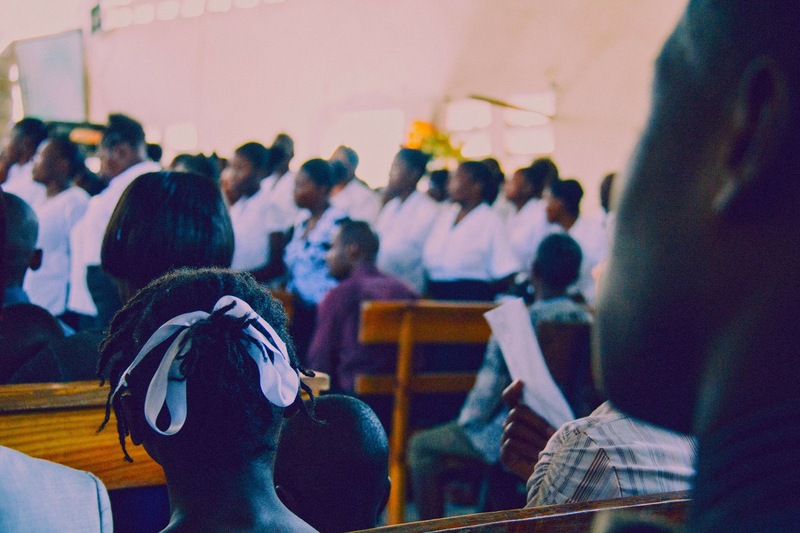 We asked Pastor Benjamin if he’d consider providing Christian ministry (such as Bible studies, counseling, etc.) to our Peace & Joy families. He sat back in his chair and spoke to the translator for a few seconds. The translator said, “he says you don’t even have to ask that question.” In other words, the was on board for whatever support the families needed and felt it was his duty as a pastor. With that, we knew we’d found our man. As our relationship with Pastor Benjamin grew, his character, integrity, and love for the Lord became apparent. This summer, we asked for his support during our July trip, and he preached an amazing sermon on light vs. darkness to the Peace & Joy Families. 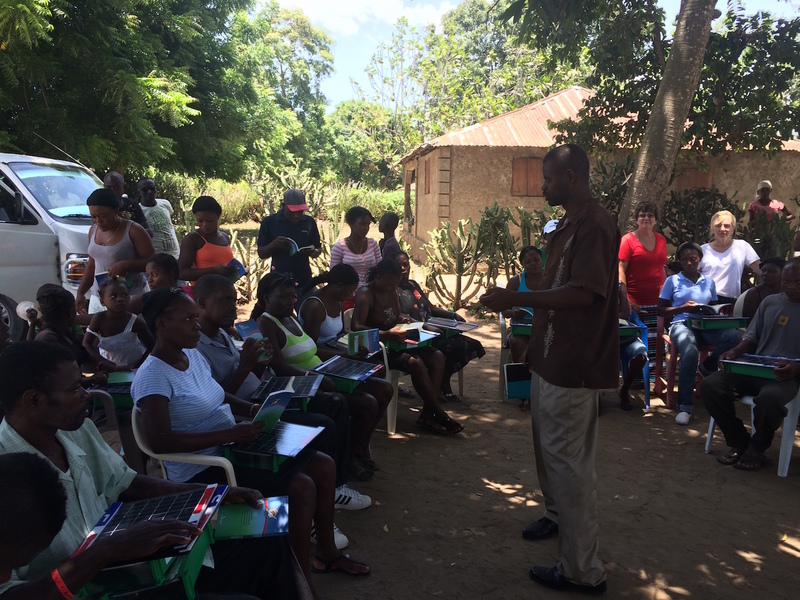 Pastor Benjamin set up a series of Bible studies for August and has been meeting with the families. 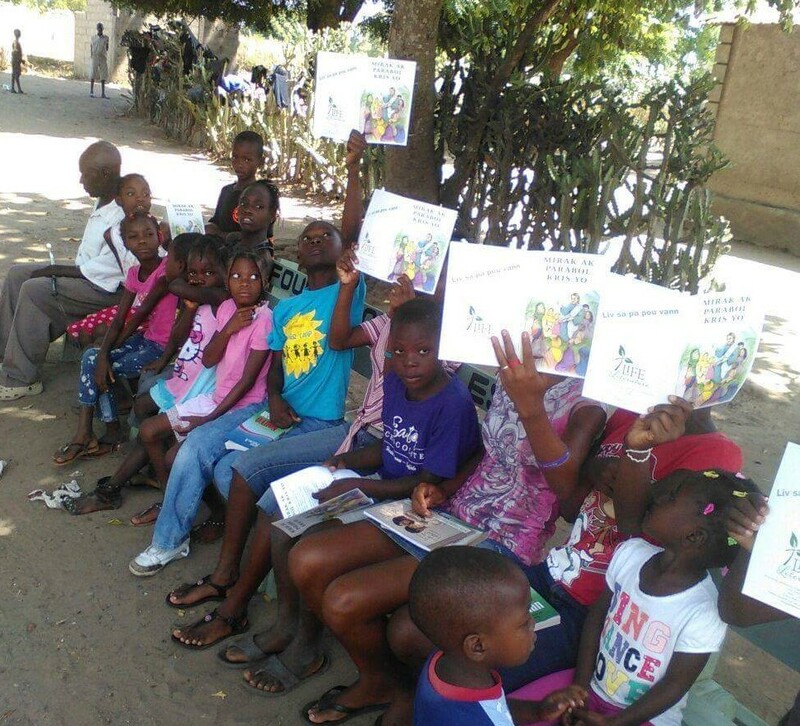 We received word this week that Pastor Benjamin met with the families this past Saturday for one of these Bible studies. Seventeen of the children were there and he did what he always does – shared the truth of God’s love for all of us. At the end of the study, 13 of the 17 children came forward and accepted Christ into their lives. Talk about a reason for joy! We can’t wait to see where this relationship with Pastor Benjamin goes and the lives that will be impacted as a result. Please continue to pray for our children and their continued growth mentally, physically, and spiritually. 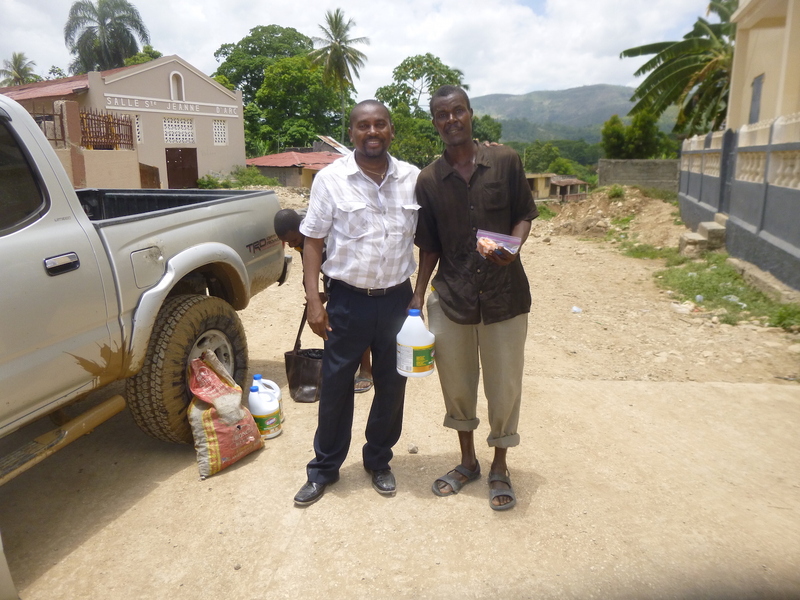 We have a project in mind to help support Pastor Benjamin in the future, so please stay tuned for more details. 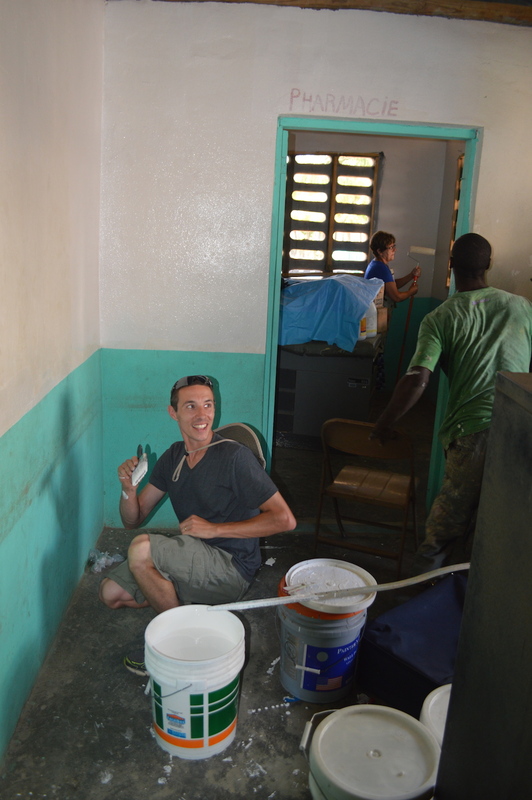 Kudos to our team from Pleasant Hills, who spent a day painting St. Anthony’s Medical Clinic during their trip earlier this month. 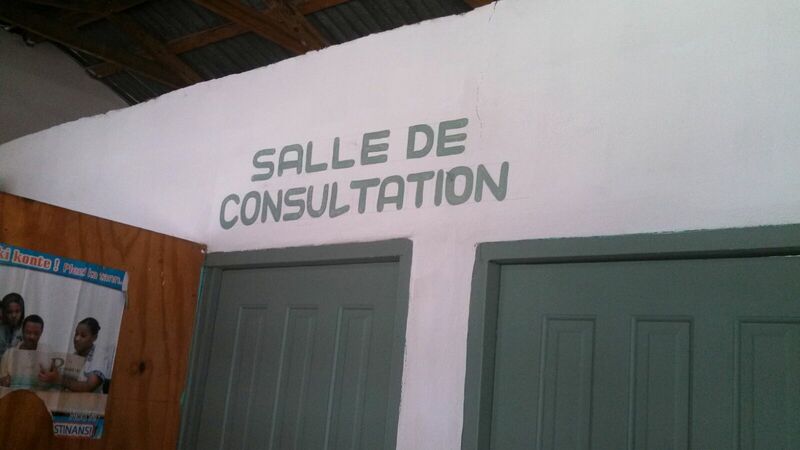 We finally got some photos of the completed work after a local Haitian painted the lettering for us. 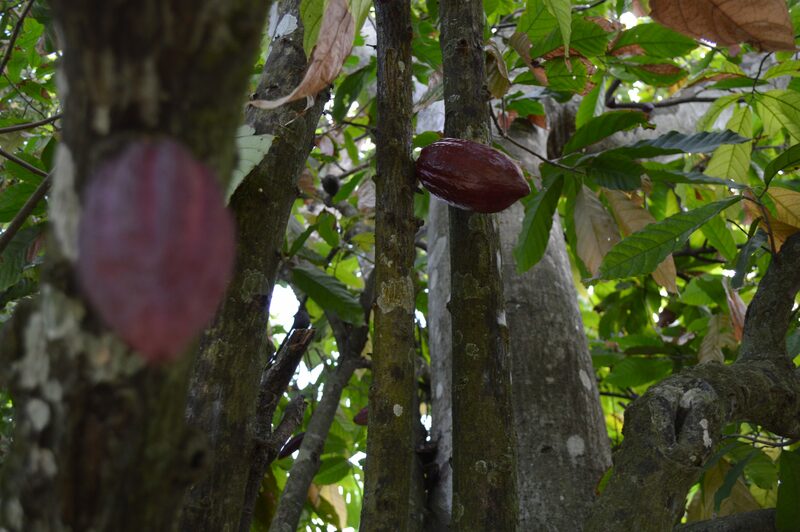 Check out the before and after below. 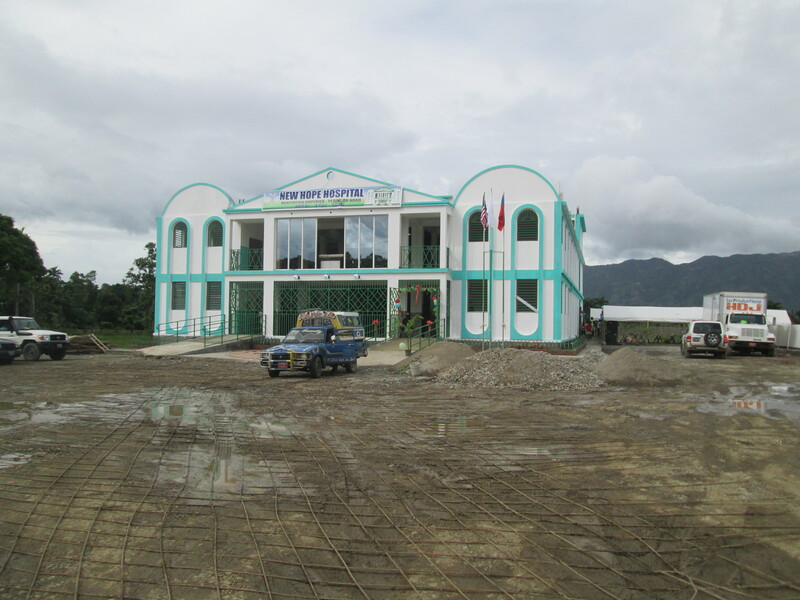 St. Anthony’s was Espwa’s first project and we continue to support it through monthly salaries, medication donations, and through annual (or more) medical missions. Please let us know if you’d like to visit it someday on one of our trips! 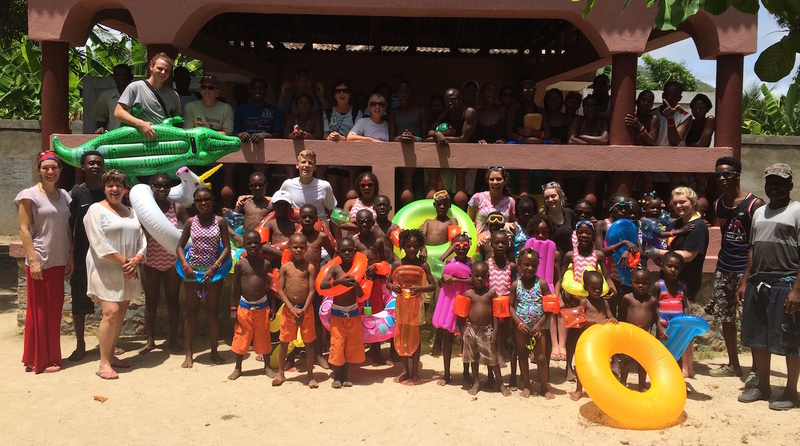 Fresh off our trip to Haiti, we wanted to share some of the big trip highlights. Team members were in-country from July 1st – 8th, and much was accomplished. 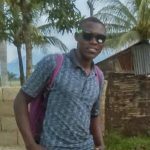 Our Special Projects Officer, Brady Cillo, arrived in-country on the 1st of July and laid some groundwork for the rest of the team that would be arriving on the 4th. 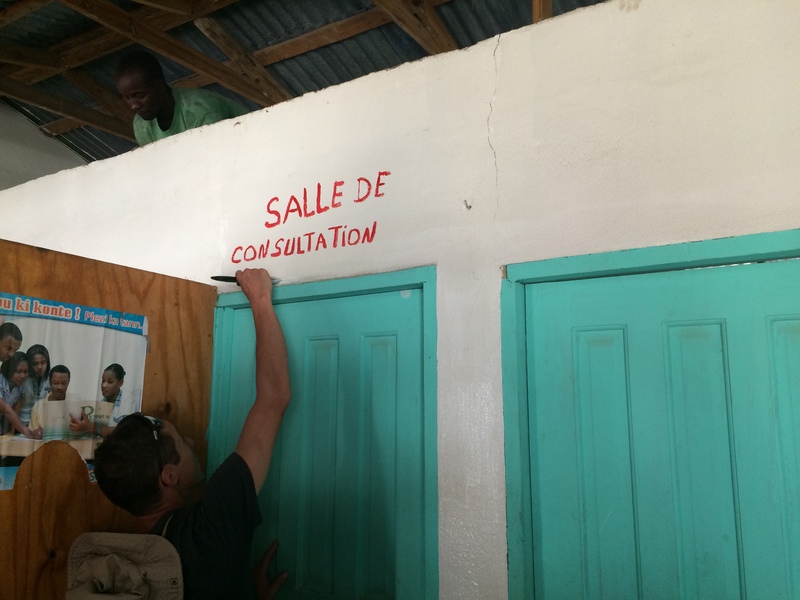 Brady used the services of Haitian Creole Tour for transportation and translation, and met with several people in the Espwa network, including Dr. Eugene Maklin, Paul Guerrier, and Frantz Louis-Charles (our in-country Haitian team members). Other tasks included meeting with Pastor Benjamin Fleurant to discuss a potential partnership between EBAC Church and the Peace & Joy Family project, meeting with the Peace & Joy families to discuss our long term vision of small businesses, and touring the hospital where Espwa has sponsored medical care for the Peace & Joy children. 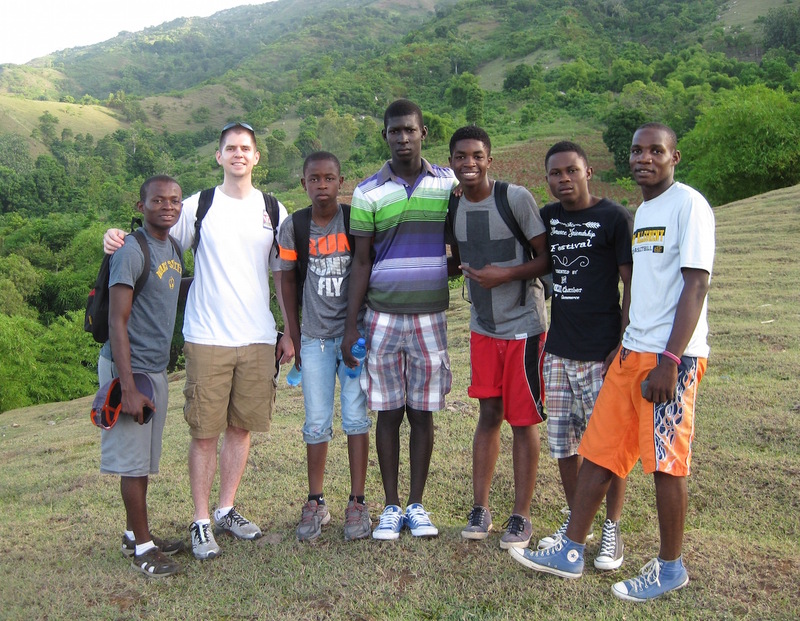 Brady also fulfilled one of his dreams by hiking the mountain north of Cap Haitien with a group of teenage orphans from EBAC Orphanage – 2000 foot elevation gain was a bit rough in the summer heat, but the view was spectacular. On July 4th, our VP, Chris Pfeiffer, arrived with a team from Pleasant Hills Community Church. The team of 12 had gone through Espwa’s pre-trip training and was ready to make an impact in Haiti by “helping without hurting.” The team showed love to our friends at EBAC orphanage, executed this year’s Peace & Joy beach trip, built and painted some benches for the Peace & Joy families, checked in on Dr. Maklin’s hospital construction, saw Jovenel’s farm, and painted St. Anthony’s Medical Clinic. One of the most exciting parts of the trip (after the beach trip!) 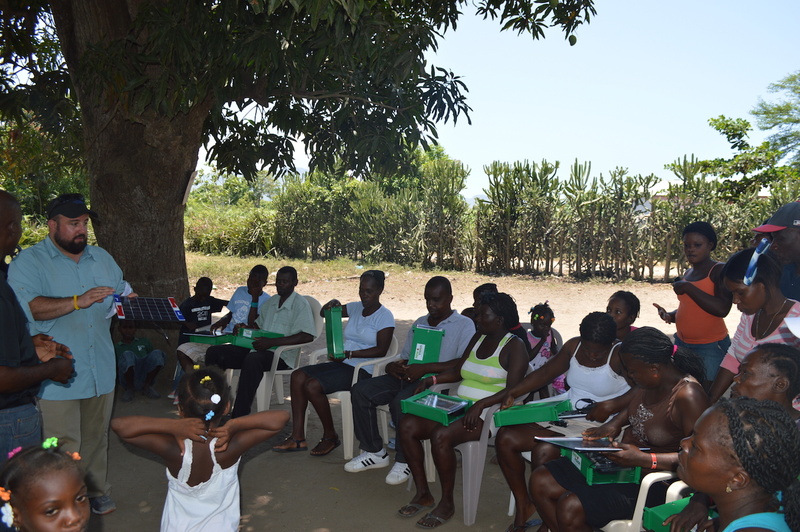 was on Tuesday when all the Peace & Joy families met at William Guerrier’s property for a day of learning about light vs. darkness. 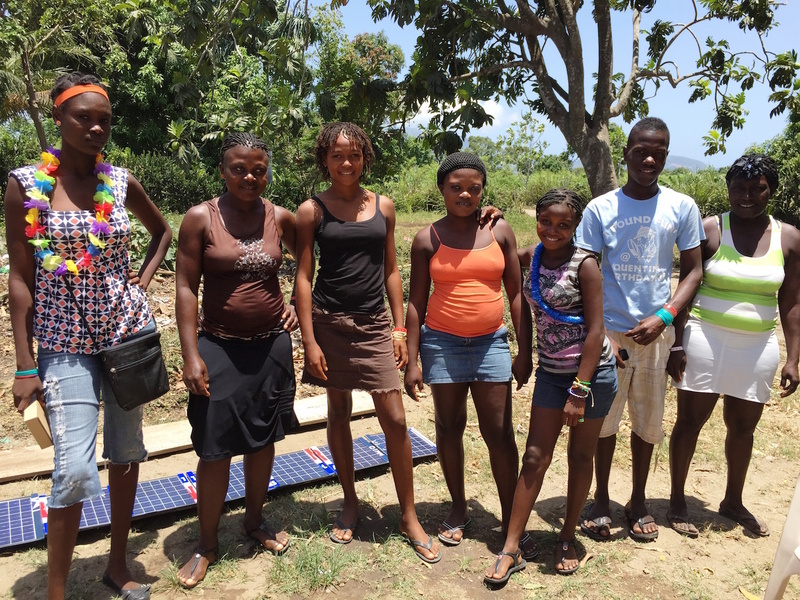 The team had packed solar light kits in their suitcases and delivered them to each family. 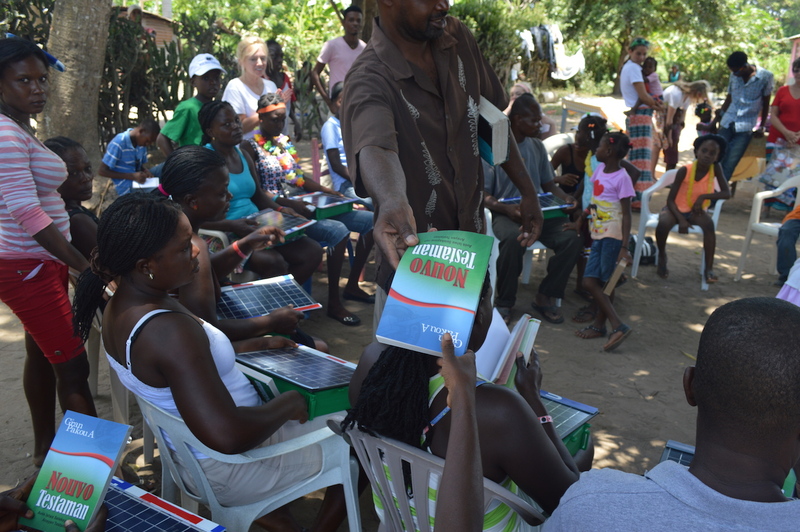 We spent a day of assembling the units, and then Pastor Benjamin Fleurant passed out copies of the New Testament and preached to the families about how Jesus is the One True Light. It was a powerful sermon and we hope the beginning of an amazing partnership between EBAC Church and the Peace & Joy families. 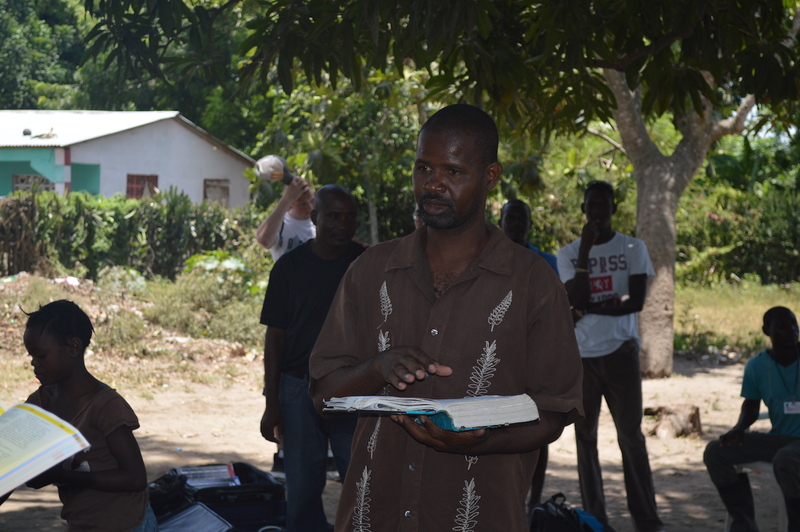 Pastor Benjamin has already set up a Bible study with the families with a first meeting in early August. 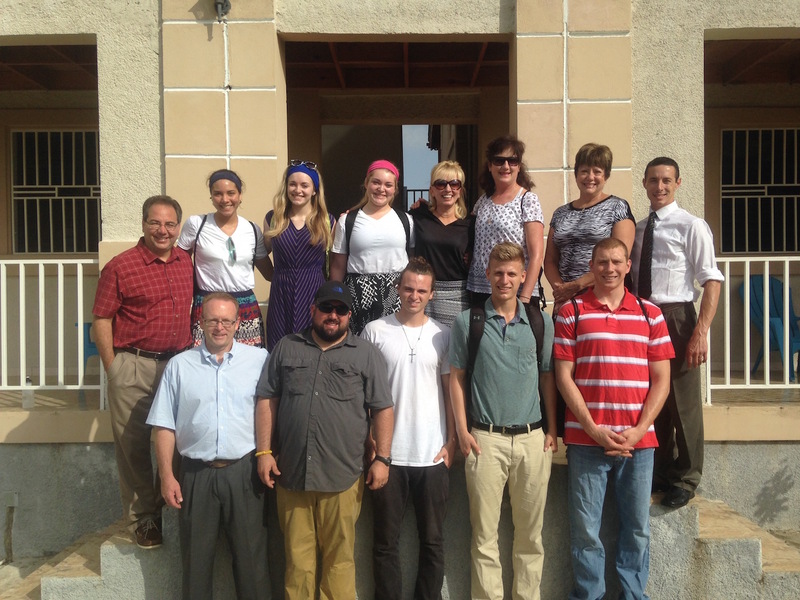 Thanks to all who prayed, funded, and engaged with us throughout the planning and execution of this trip. Your hard work and dedication does not go unnoticed – we couldn’t do it without all our faithful supporters! 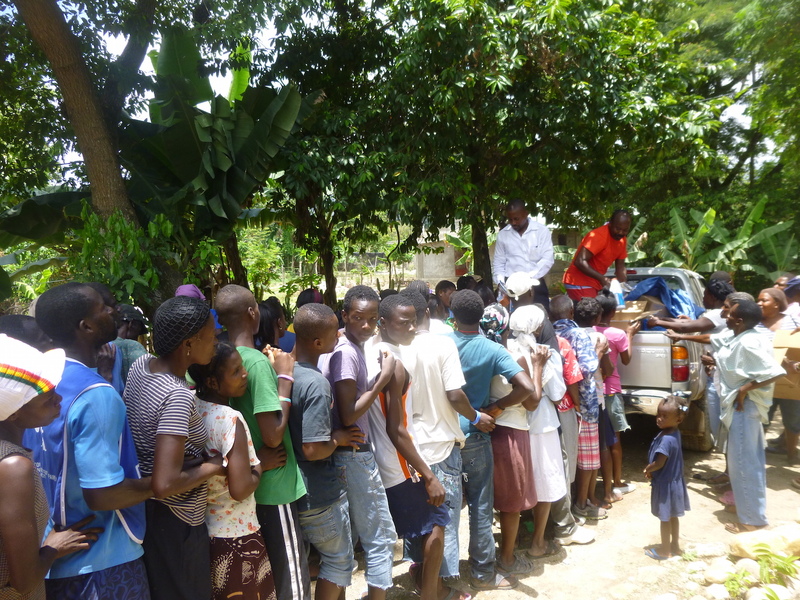 Our Medical Director in Haiti, Dr. Eugene Maklin, recently made us aware of an urgent need due to an outbreak of cholera in some of the rural regions outside of Cap Haitien. 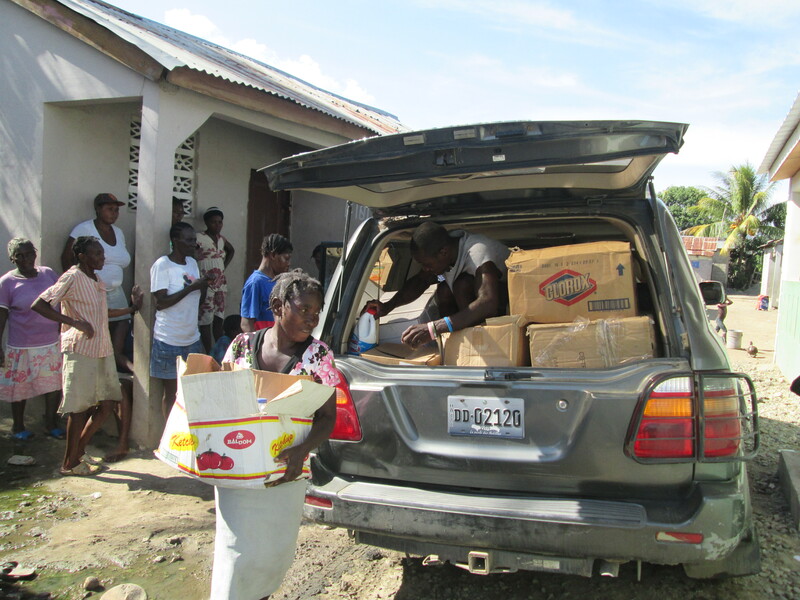 Doc has been soliciting donations of supplies and funds and with them, has been making distribution in the affected areas. 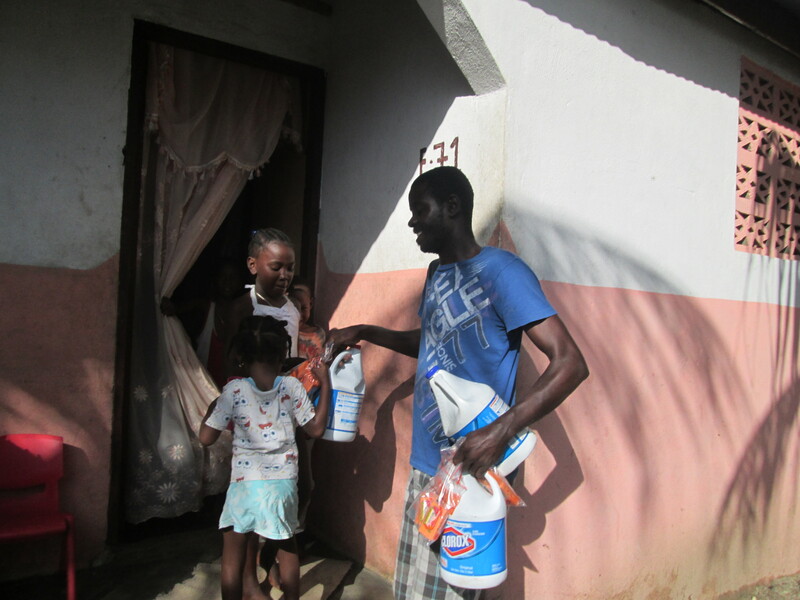 When asked what his biggest needs are, he told us Clorox bleach, Aquatab water purification tablets, soap, and hand sanitizer. 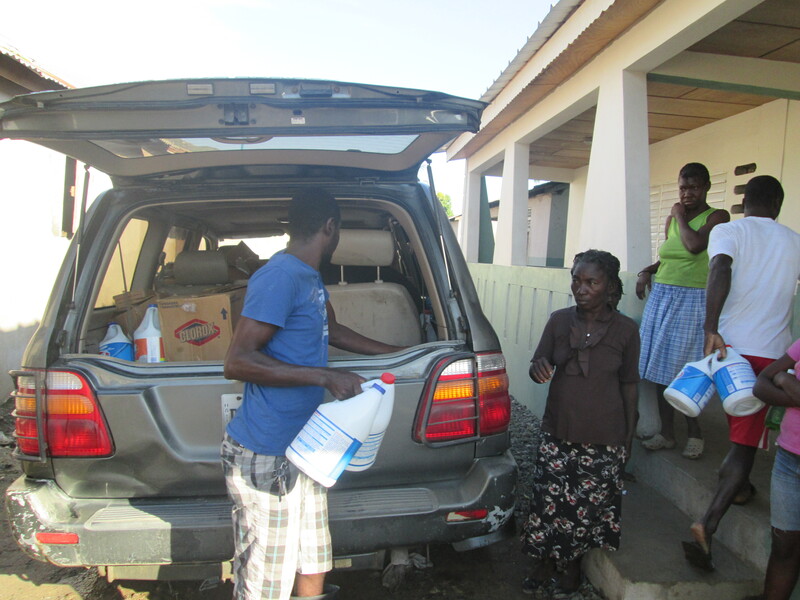 We were able to bring Doc some supplies on our latest trip, but we also provided some funds to purchase supplies in-country. 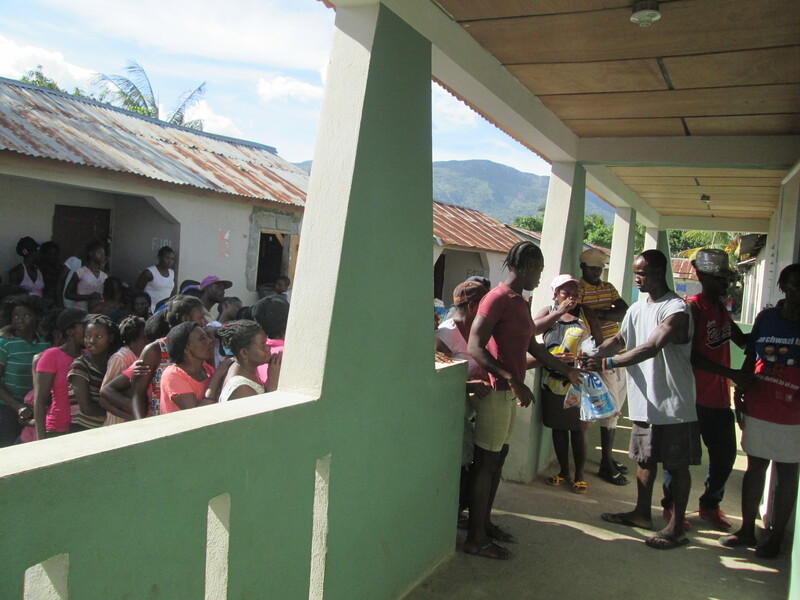 Here are a few more pictures of Dr. Maklin distributing supplies in rural Haiti south of Cap Haitien. If you would like to make a donation to this worthy cause, please visit the full Razoo donation site and add “Cholera outbreak” to your comments. One of the ongoing needs for both Gran Chorale and Chorale Lajenes is the purchase of choir robes for their performances. Espwa gave support funds to each of the choir directors (Simon and Marirose) during the trip, but the choirs are still about $1000 short each. The funds will purchase robes for over 85 people. If interested in donating to this project, add a comment of “Choir Robes” to your donation on the full Razoo site here. 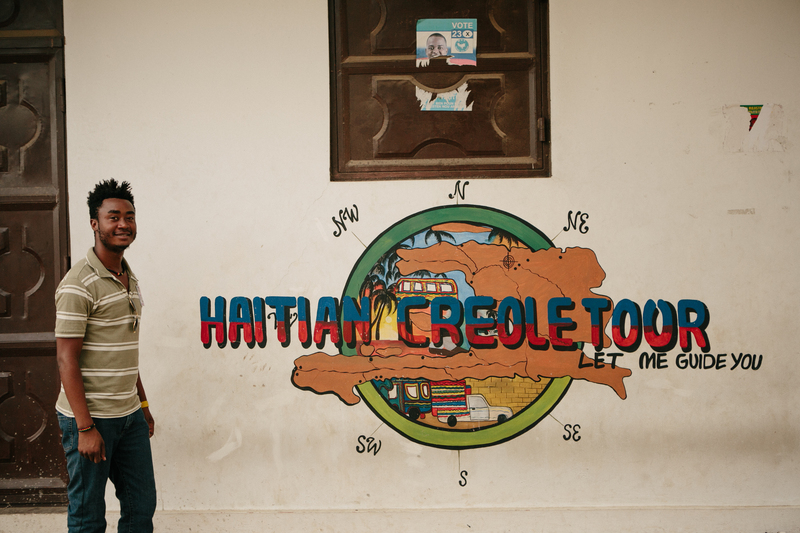 Espwa’s “getting in on the ground floor” of the Haitian tourism industry by supporting our friend Frantz’s business, Haitian Creole Tour. Exciting time to be involved as the country starts to wake up and capitalizes on some of its biggest resources…a beautiful coastline and historical sites…to draw tourists. Check out the post below.